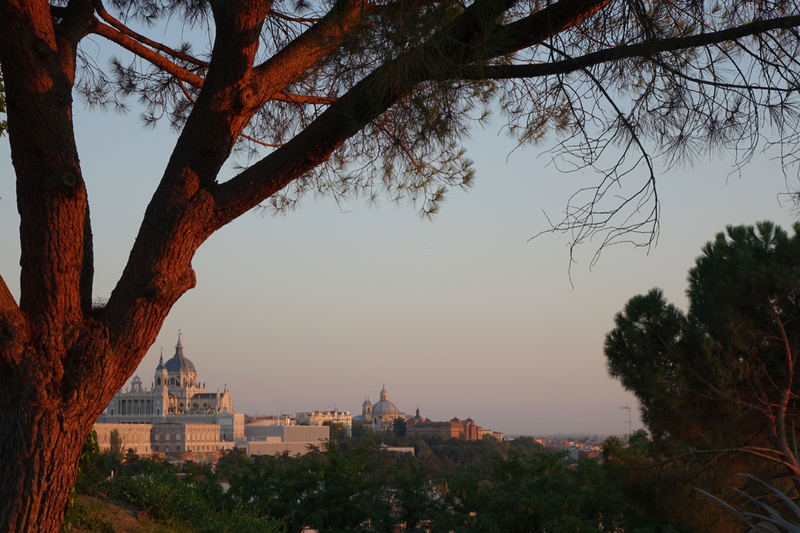 I had a little lie in on what was going to be my last full day in Madrid. After showering and getting dressed, I nipped to the nearest shop to get a drink. That was a petrol station just across the road which – as I couldn’t be bothered walking down to the crossing – meant navigating a slightly hairy eight lane road. The fact there wasn’t a full on convenience store nearby was my only real grumble about the hotel I was staying at. 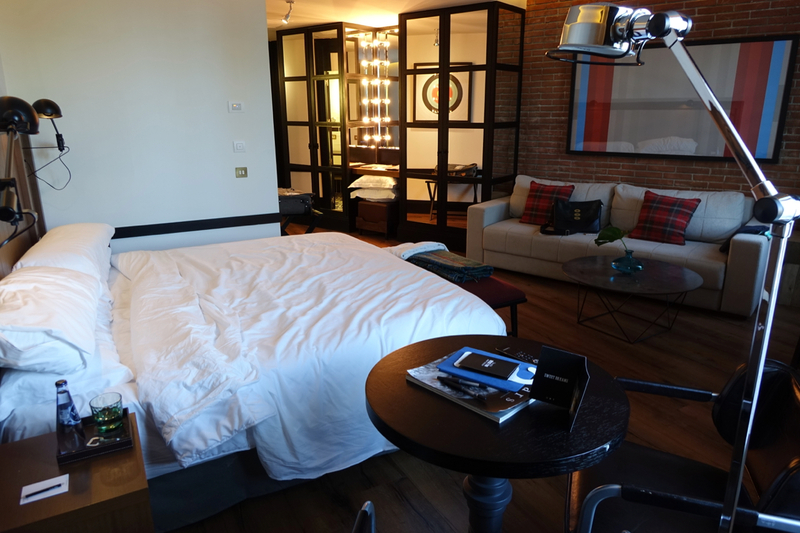 After narrowly missing out on a hotel in Madrid’s centre which had become fully booked while I was looking at it, I’d settled on a stay at the Hotel Only You Atocha. 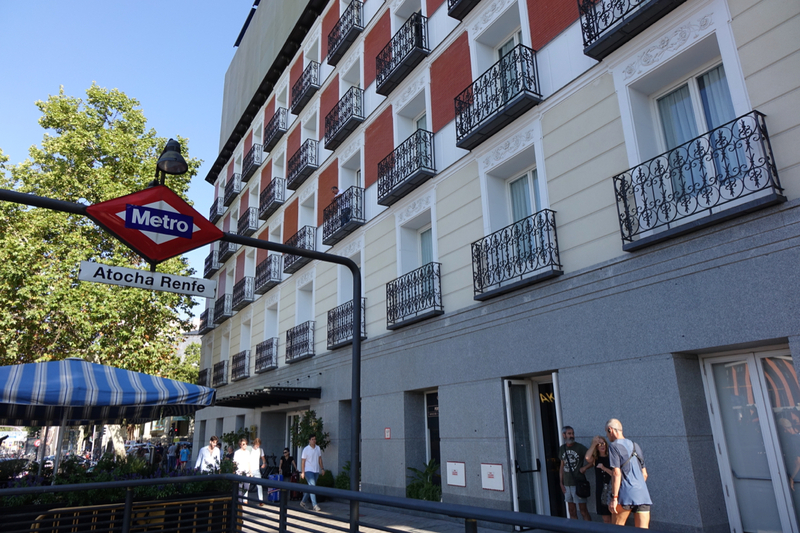 Right across from Atocha train station, it’s relatively new, having opened in December 2016, and is the second hotel from the Only You brand in the city. I settled on it in the end as I liked the style of decor, and it was available at a decent price. I booked a junior suite, which consisted of one large room with a double bed, sofa and desk, and a bathroom with double sinks and a shower (fans of baths would be disappointed). 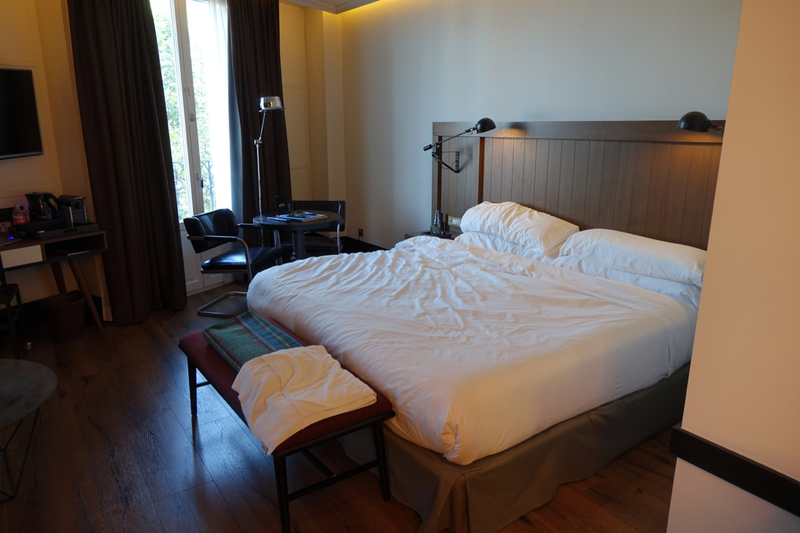 There were some useful touches in the room – a Nespresso machine, a TV that you could stream to from your iOS or Android device (handy for catching up on EastEnders and Killing Eve) and a turndown service which saw a small pack of branded biscuits in the shape of ‘Zzzzz’s left each night. 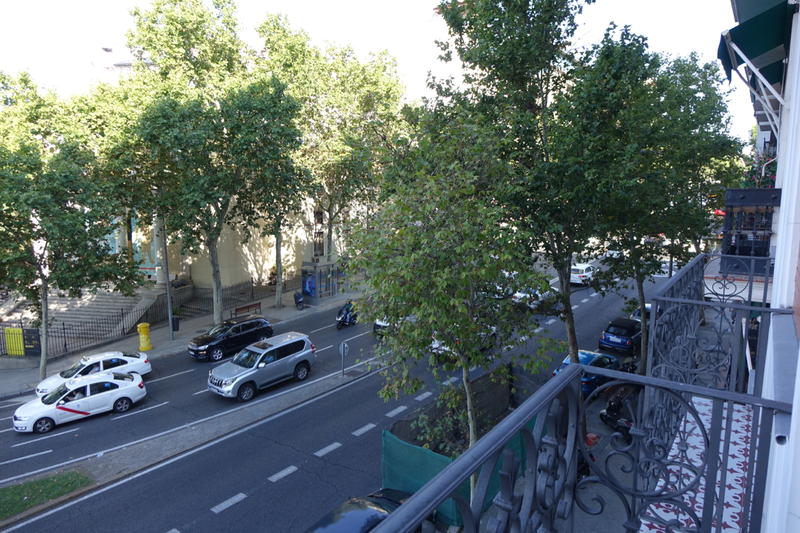 There was also a small balcony which overlooked the road running up to the Buen Retiro park. 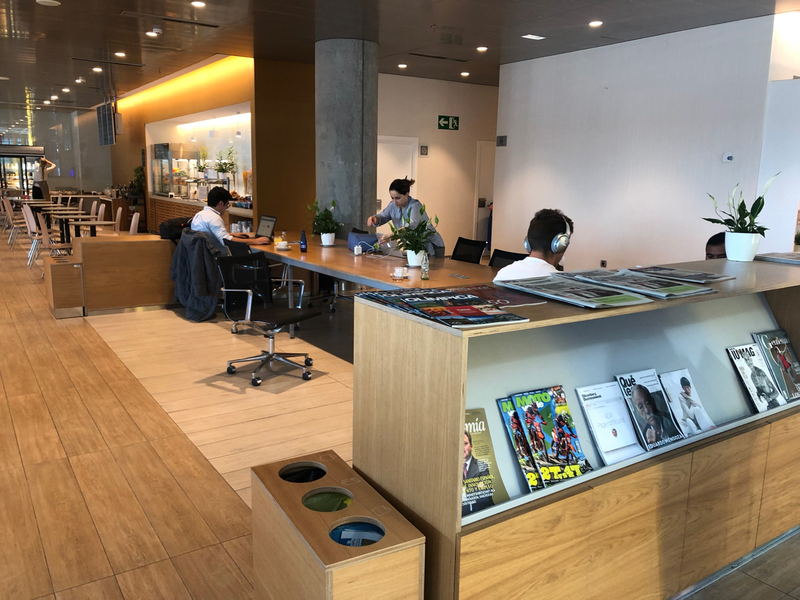 I really can’t complain about the service either – everyone I spoke to was friendly and cheery, and you got the impression they’d go out of their way to ensure you had a good stay. Breakfast each morning (extra in my case) was served in a rooftop restaurant – an outdoors terrace was the ideal spot to eat in the morning sun. 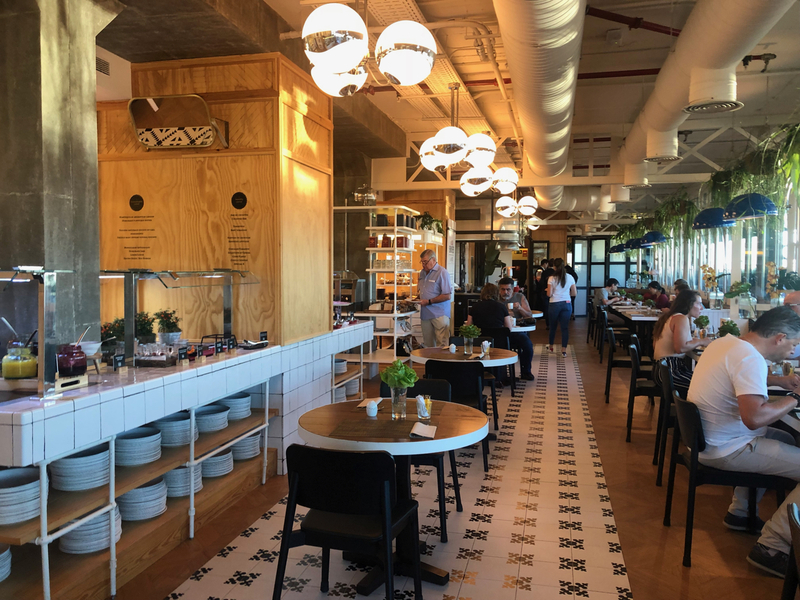 I did run into trouble each time I tried to sit on the terrace though – either having a fight over a table or apparently nabbing a table which had already been ‘reserved’ although there was nothing to say that was the case. 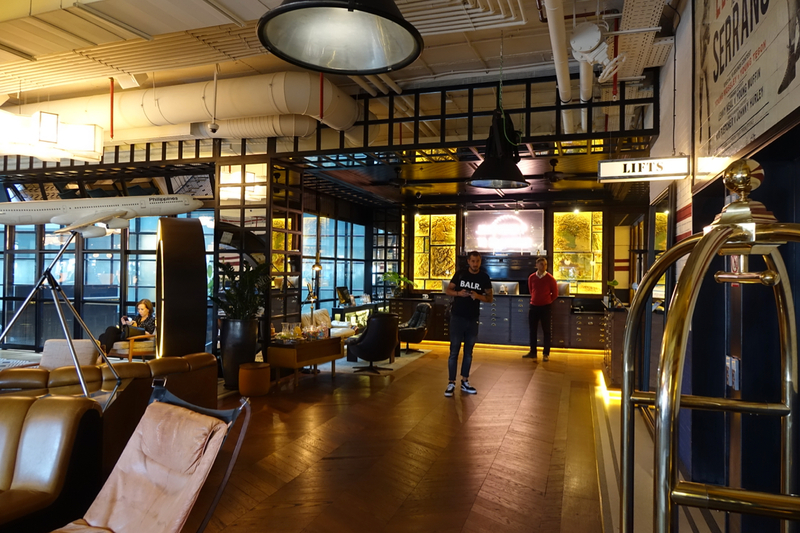 The funkily-decorated ground floor had another restaurant, a cafe selling pastries and coffees, and reception. There was a small gym too although I didn’t check that out. 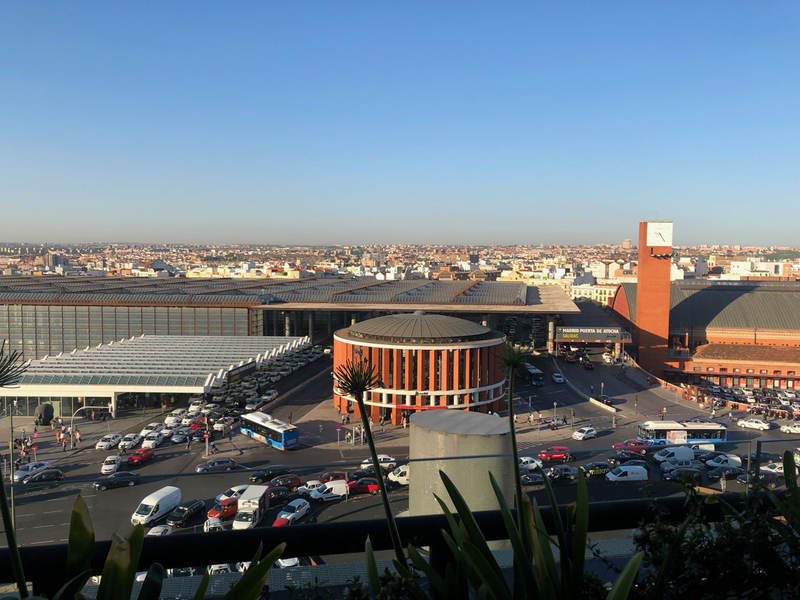 All in all I was happy with the hotel – it certainly could be more central, but it was usually no more than a ten or fifteen minute trip on the metro to get to wherever I wanted to go, or a twenty five minute pleasant walk into town. Back to my day in Madrid! 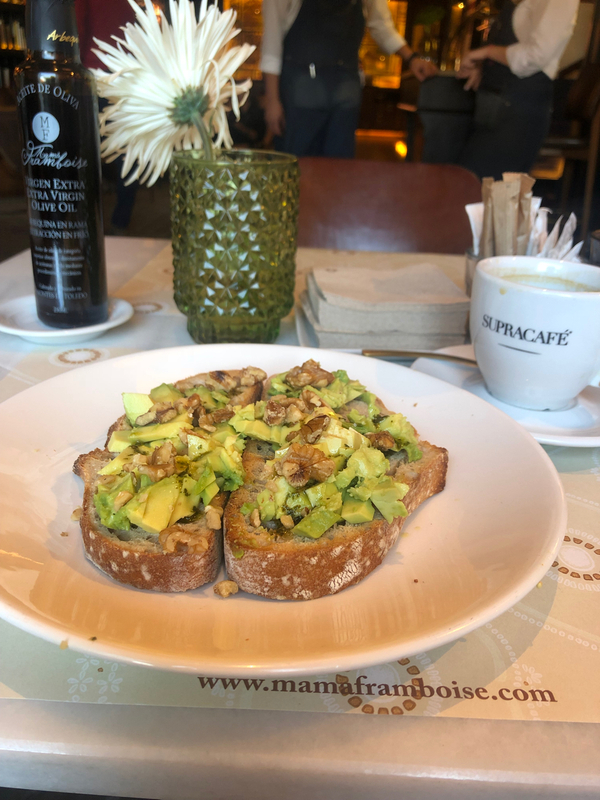 I started Sunday morning with a breakfast of avocado and walnut on toast at the aforementioned hotel cafe, accompanied by a mug of hot black coffee. It felt healthy after a recent diet of burgers and tapas. 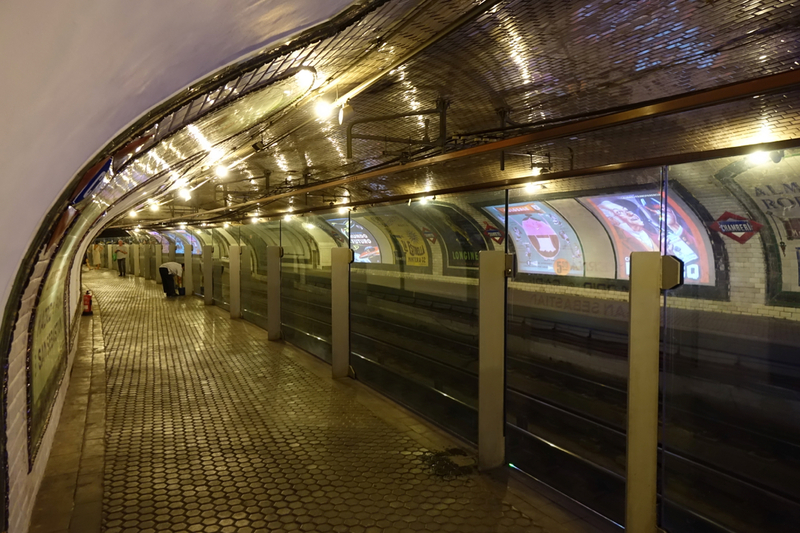 After grabbing my gear for the day, I descended the stairs right outside the hotel into the metro station and jumped on a train. 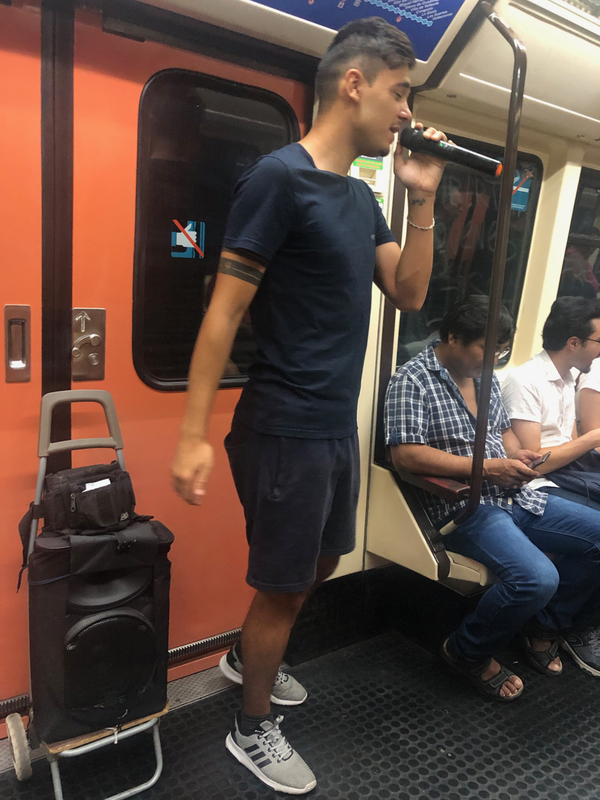 Soon the carriage was filled with the sound of music from a busker with not only a wireless mic but a pretty loud speaker! 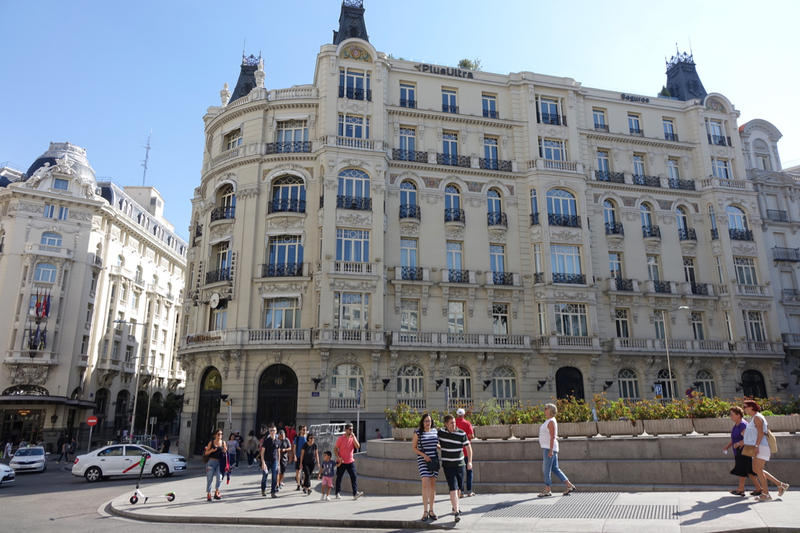 Yet again the weather was gorgeous as I emerged onto Madrid’s streets. The sun felt warm on my face, the skies were a deep blue, and there wasn’t a cloud to be seen. 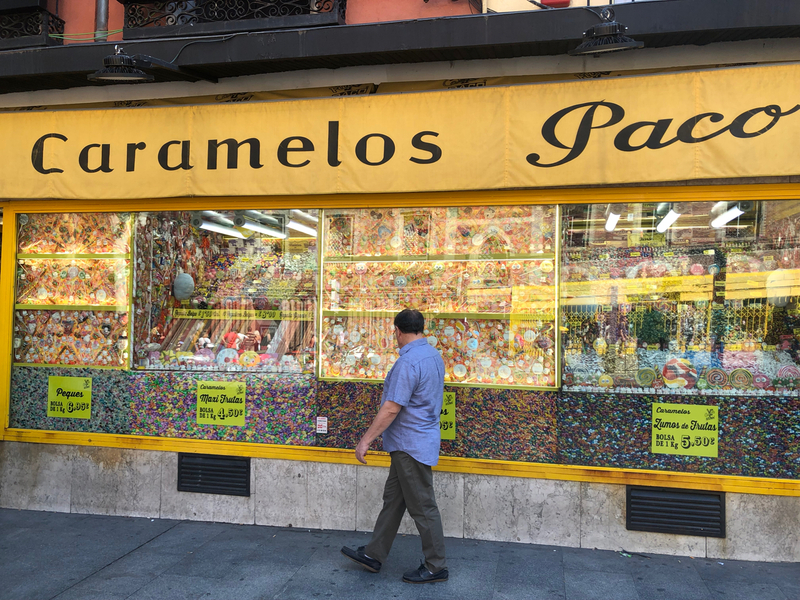 I was heading back to the attraction I’d tried – and failed – to visit the day before, when after using maps on my phone I’d arrived only to find a shuttered shopfront. Googling the place had then alerted me to the fact that it had actually closed 45 minutes earlier. This time I’d checked before setting out that it would actually be open. Using maps again, I arrived at exactly the same spot as I had the day before, only to be greeted by the same shuttered store. Was I just being really thick (that has been known) not being able to find the entrance? I decided to wander up to the top of the street and take a peek around the corner. And there it was! The entrance I’d been looking for. 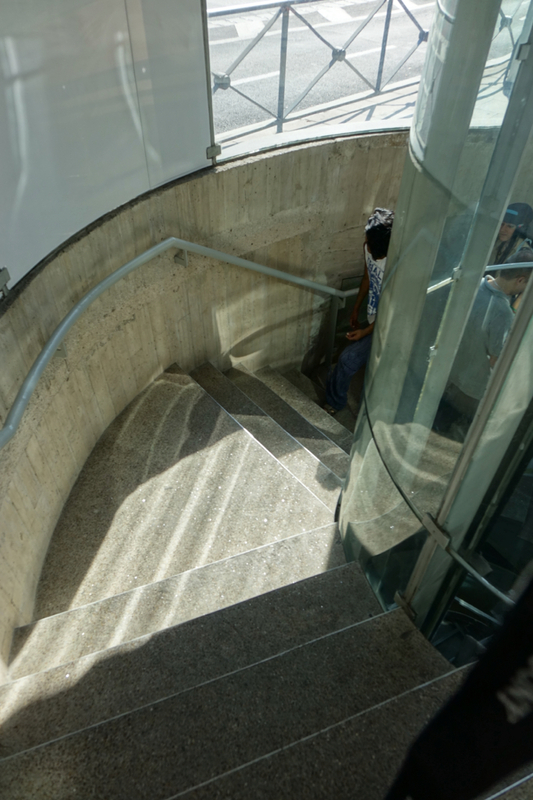 Andén 0 only holds 56 people at a time, and entrance is on a strict one out, one in (or is it one in, one out?) basis. As such, a short queue snaked around outside a chemist beside the entrance, guarded by a security man. After about a twenty minute wait, it was time for me to descend into the underground attraction. 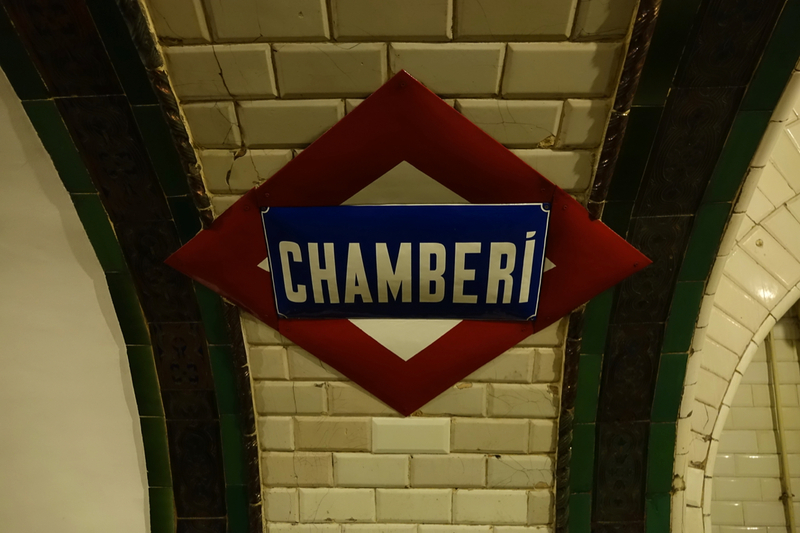 Andén – or Platform – 0 is a project of the Madrid Metro which consists of a building plus an old metro station (Chamberí) which was constructed in 1919, and closed for good in 1966. 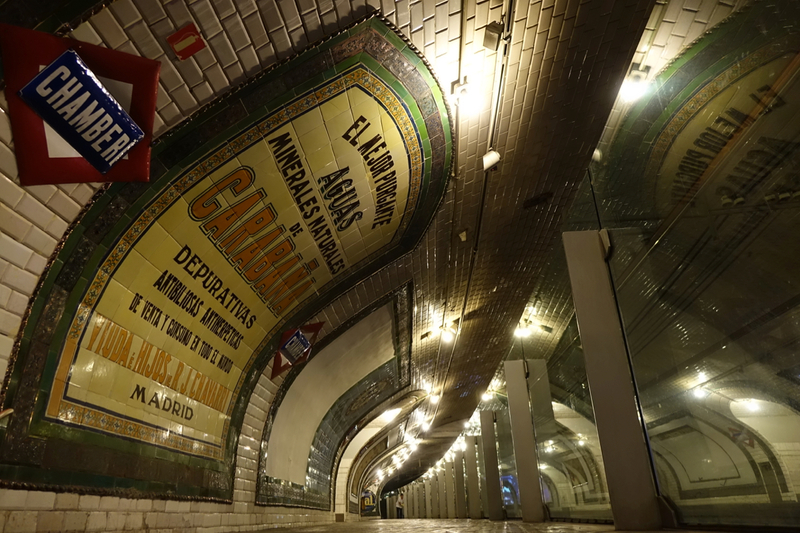 The station was designed by architect Antonio Palacios who designed many of Madrid’s landmark buildings. 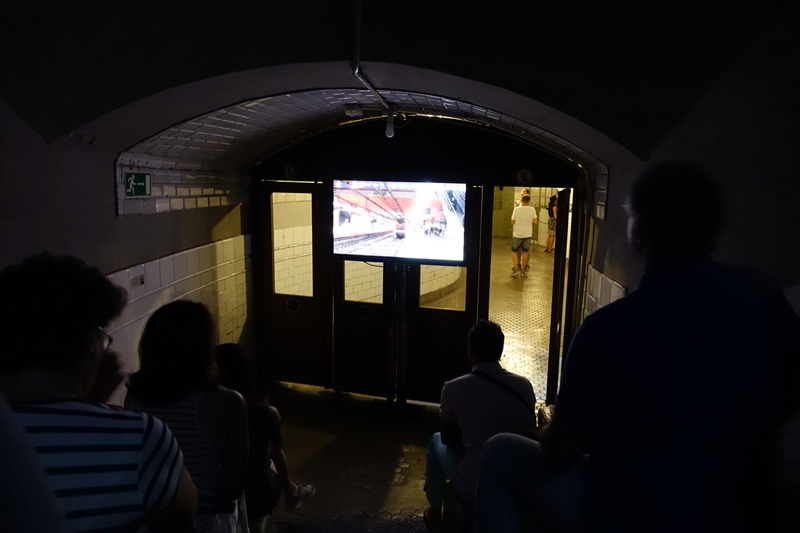 Turning left after going through a small doorway, I entered what looked like an old metro carriage front, and took a seat in a small auditorium which was playing a film about the history of Madrid’s metro. The film was in Spanish – with subtitles, although unfortunately they were also in Spanish. Weirdly as I sat there I found I could actually decipher quite a bit of what was going on as many of the words in Spanish looked a bit like their English equivalent. Or maybe I got the whole thing wrong, who knows! After watching the film for a while, I headed off to explore the station. Given the numbers of visitors at any time are so restricted, I often found myself completely alone, which meant the whole place seemed just a little bit on the spooky side. 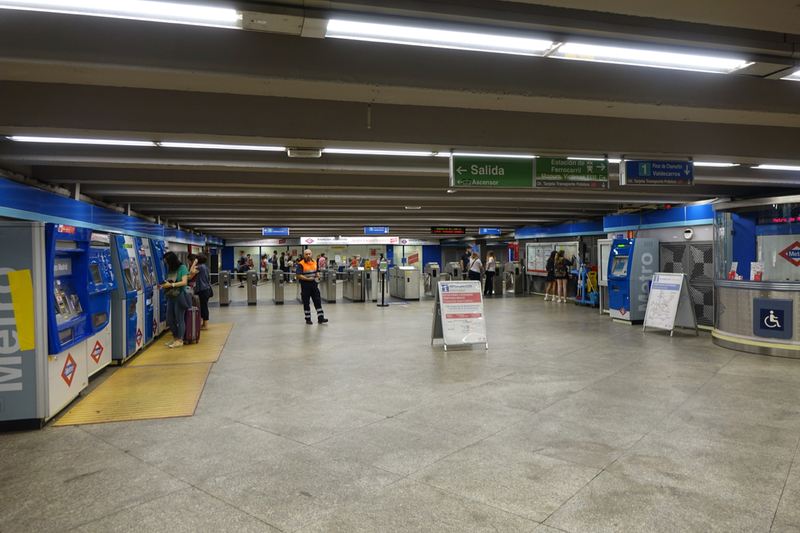 After passing by an old ticket hut and barrier, I moved along the corridor and descended the steps onto the platform. 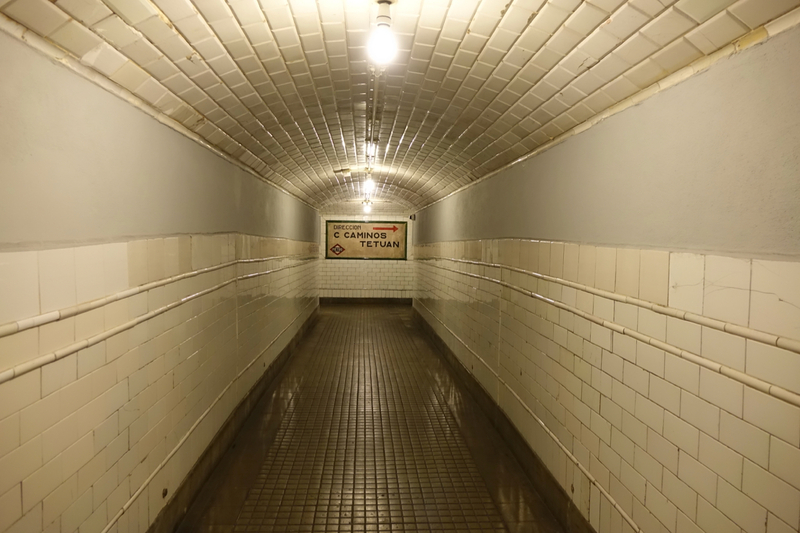 The platform itself has been completely restored, with beautiful tiled adverts from the twenties. I walked along the length of the platform, the only other person visible a lady mopping the floor. 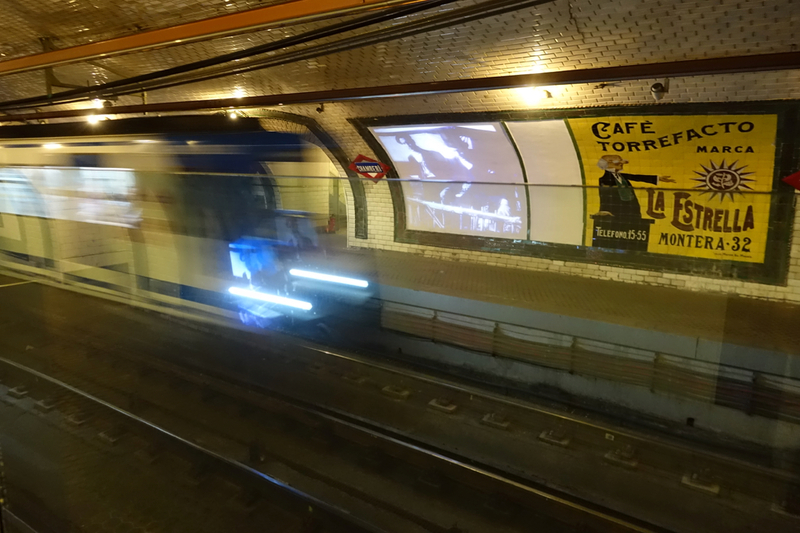 I was surprised when a low rumble gradually got louder and a metro carrying passengers passed through the station – while it’s closed, obviously it’s still on a working line. You can only access one side of the station, so after taking some photos, I headed back upstairs. 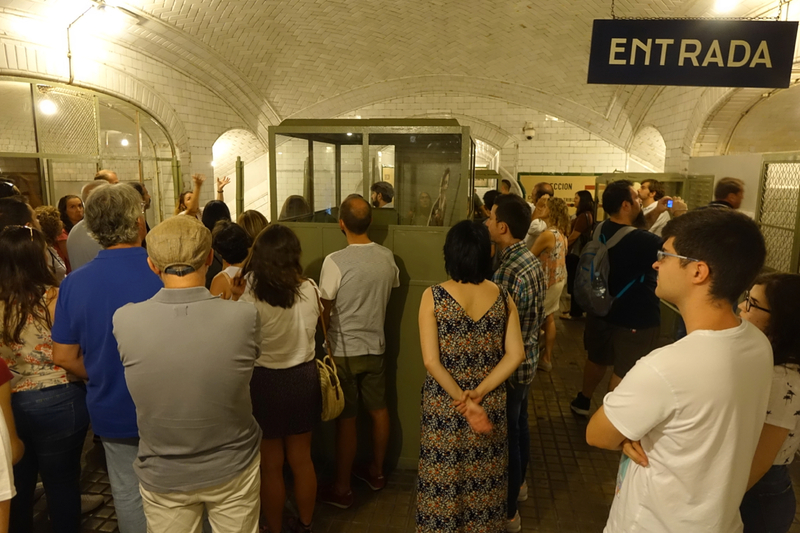 There was a tour getting underway in the ticket hall, which I would have joined had it not been in Spanish. 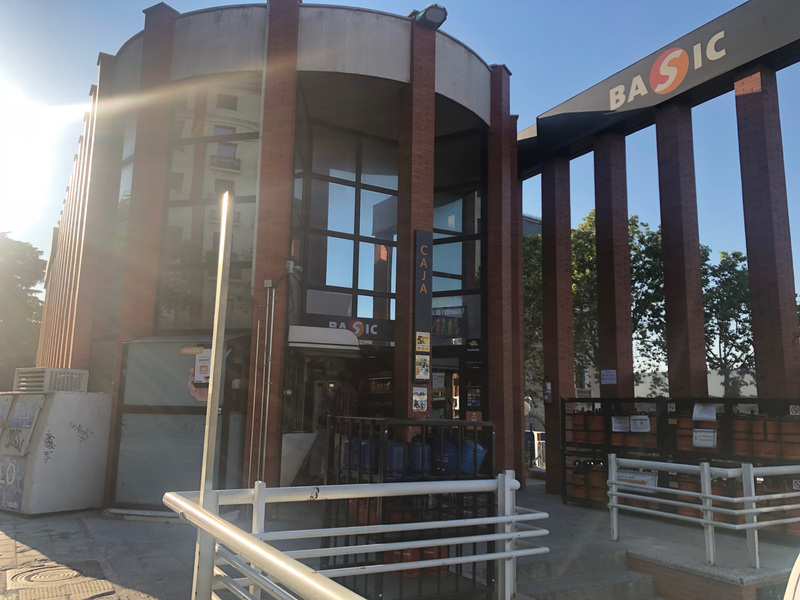 I’d have liked to find out more about the station – unfortunately there aren’t really any information boards or anything like that to tell you more about the place. Still I was glad I’d visited – it was something different to do on my trip. 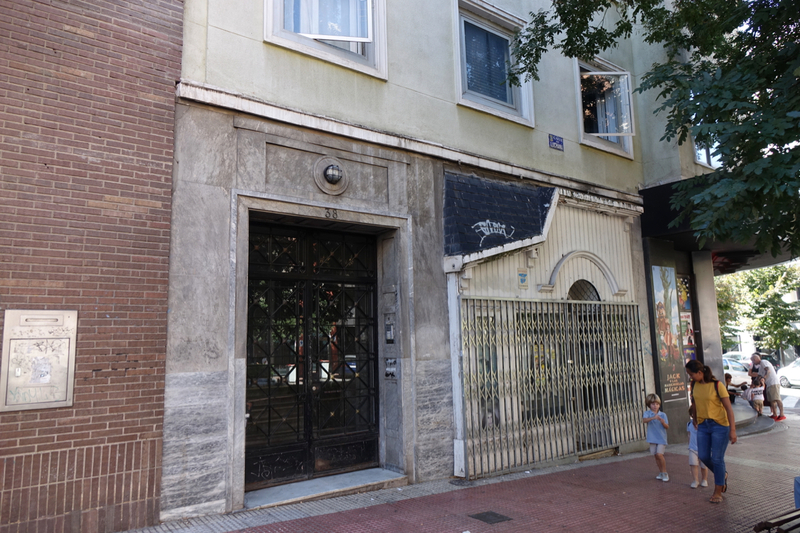 As an aside, I discovered Andén 0 via the Atlas Obscura website – which is a brilliant resource if you’re looking for unusual spots in a city when planning a trip. Back outside, by now the queue to enter the station was snaking around the corner of the chemists, so I’d timed my trip well! 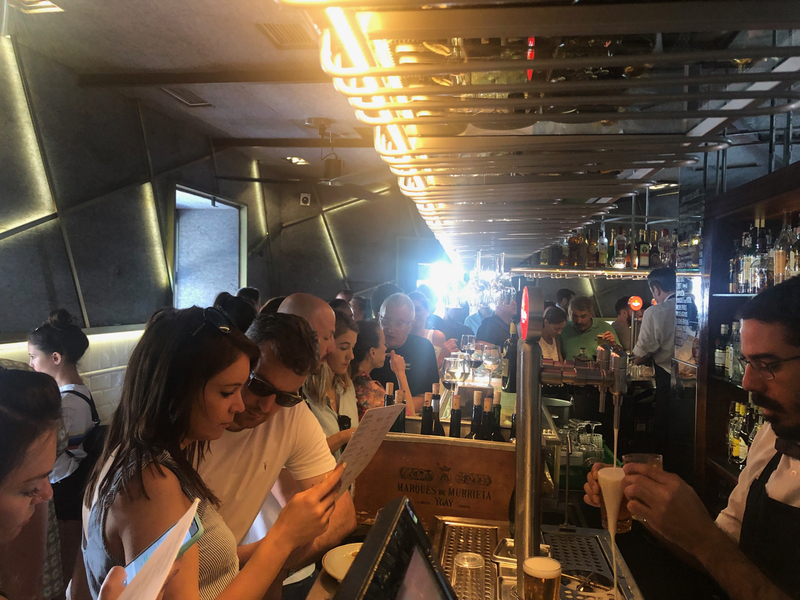 After my trip to Andén 0 I decided to head off and explore what is a major attraction on Sundays in Madrid – for locals and tourists alike. El Rastro was in every guide book I’d looked at before visiting Madrid. 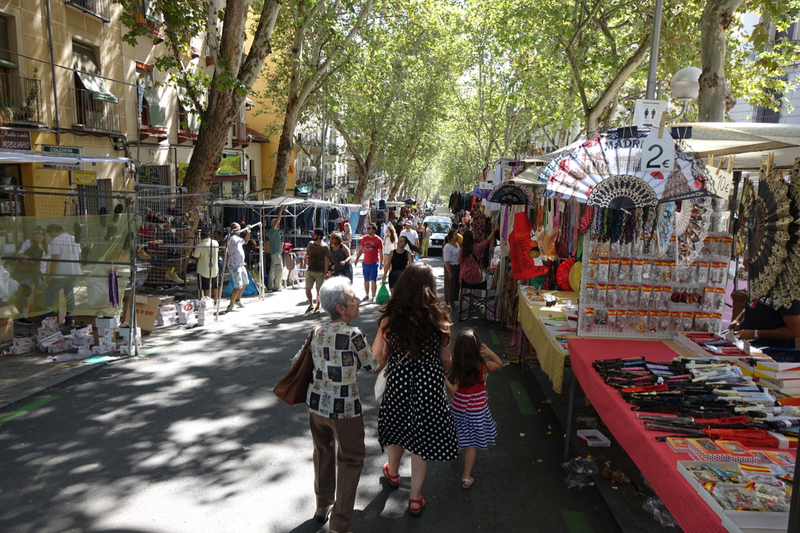 It’s an enormous flea market that takes place every Sunday in the La Latina area. I’m not a massive fan of flea markets, usually just thinking they’re full of tat, but I thought I’d go and check it out anyway for the atmosphere. 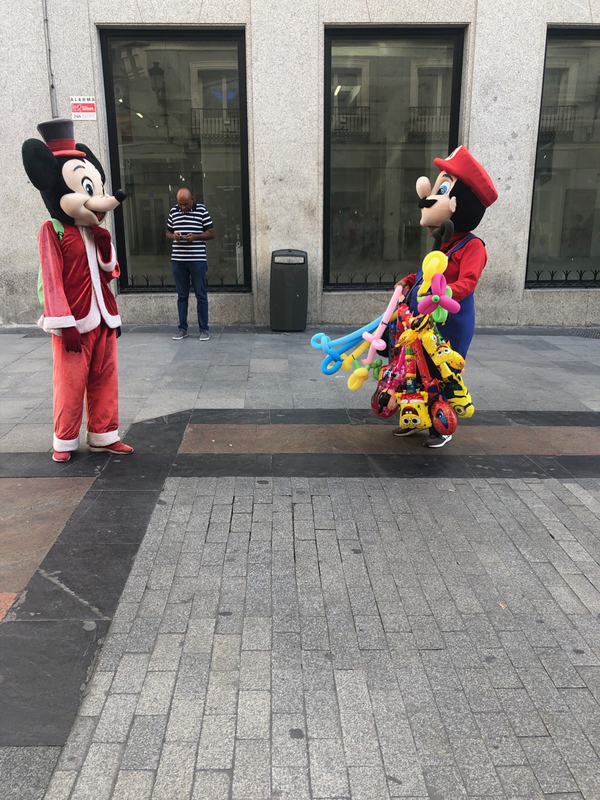 After getting off the metro at Tirso de Molina station, I stepped into a tree lined plaza, and straight away spotted people hawking their wares. They were more trinkets for tourists I think, as the main market was a five minute walk away from the metro station. 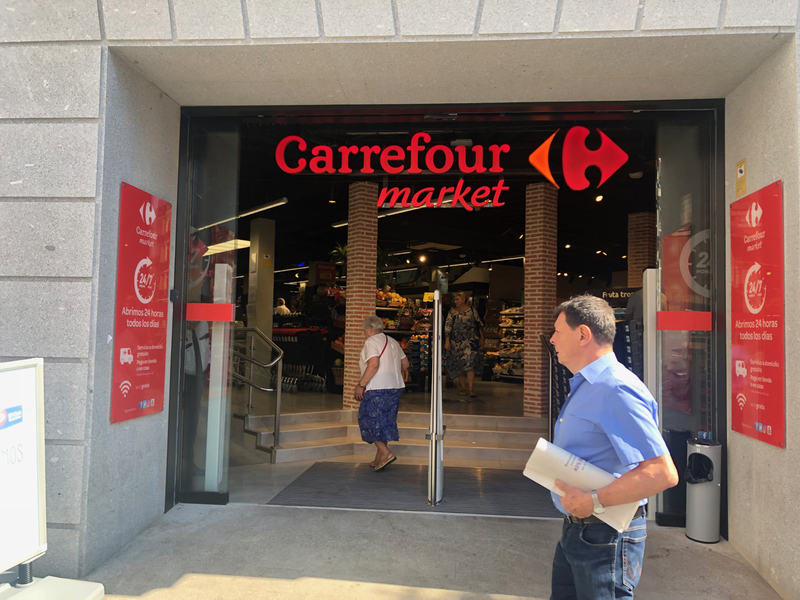 Spotting a Carrefour supermarket I decided to go and have a bit of a nosey around and get some chocolate milk. 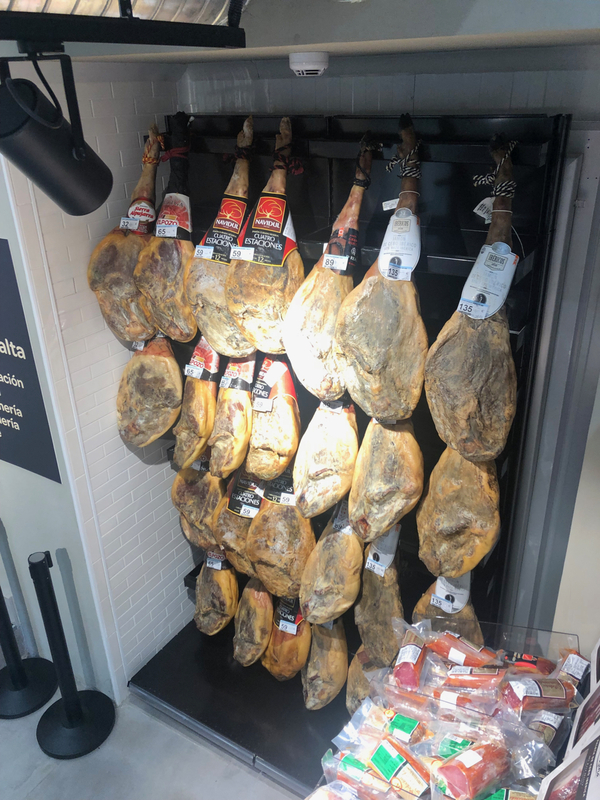 Man the Spanish take their hams seriously! Despite being on two levels, the supermarket wasn’t massive, but the ham selection was pretty impressive…. I grabbed some small tins of smoked and sweet Spanish paprika to take home too. Back outside, I turned down the street towards the market, and soon came across it running perpendicular to the street I was walking down. As I suspected the market looked like it sold quite a bit of tat 藍 and it was rammed. So I decided to come back later, and go for a wee wander. Turning left along a main street, I came across what has to be the most gobsmacking sweet shop I’ve ever seen. 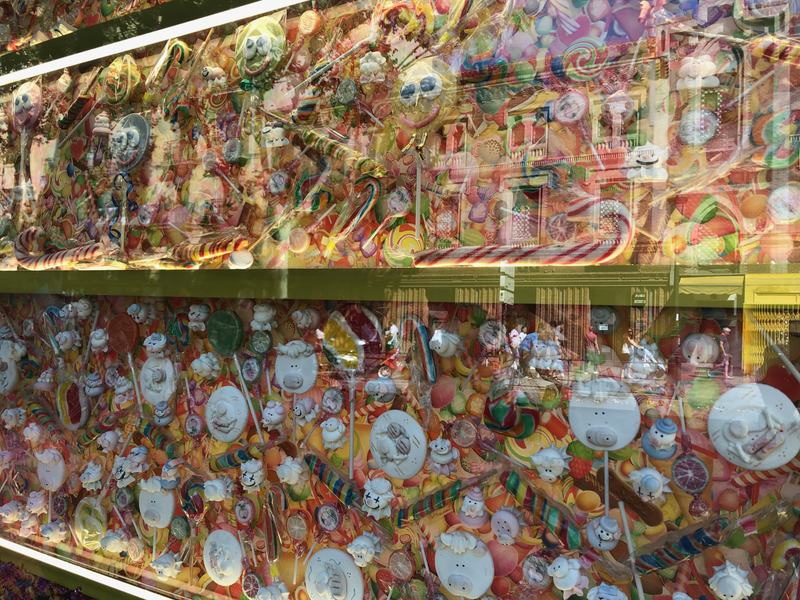 The window was packed full of colourful lollipops and sweets of all kinds and colours. I don’t have a massive sweet tooth, but I wasn’t going to pass by without stepping inside! Once in the door, everywhere you looked – just like the windows – was jammed with sweets and lollies. It must be heaven for kids! 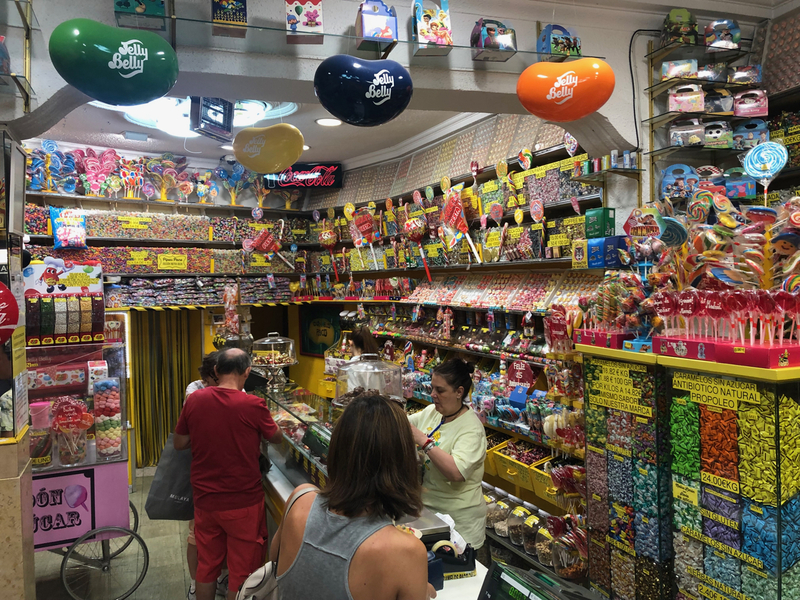 I spent a good five minutes looking at all the different confectionary, and trying to pick something out for my niece and nephew. In the end I decided to get two of the emoji lollipops displayed in the window. But after waiting politely in the fast moving queue, it turned out they had none left! I had another look ‘round but decided there was nothing else that was out of the ordinary and which I couldn’t get at home, so I decided to leave empty handed. Standing in the sun outside, I had a quick flick through my guidebook to see what else was in the area, and headed off to a shop that sounded interesting. The guidebook said it was closed on a Sunday but I thought I’d take a chance anyway, as it wasn’t too far away. Strolling down the street, I passed a cool looking restaurant which looked packed. I did a quick google of the name and it seemed to get rave reviews, so I made a mental note to return later for lunch if it had quietened down. Turning round a corner I walked down a picture perfect street. Once again small bars were doing a busy trade, with regulars standing chatting outside. 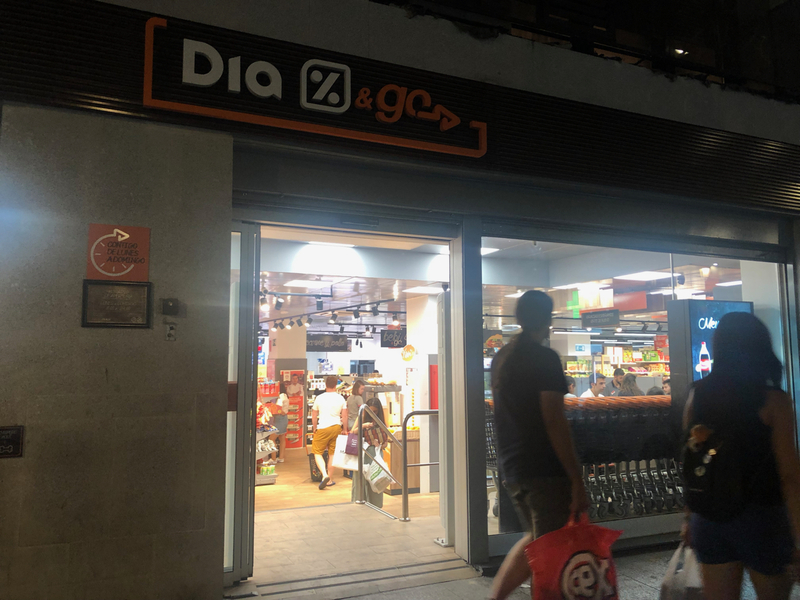 I eventually arrived at my destination – Botería Julio Rodríguez – which unfortunately for me really was closed – just as the guide book had suggested. Julio makes traditional Spanish botas. I wasn’t 100% sure what they were but knew they were something to do with wine. It turns out they’re Spanish wine skins for transporting wine – traditional ones are made out of goat skin. 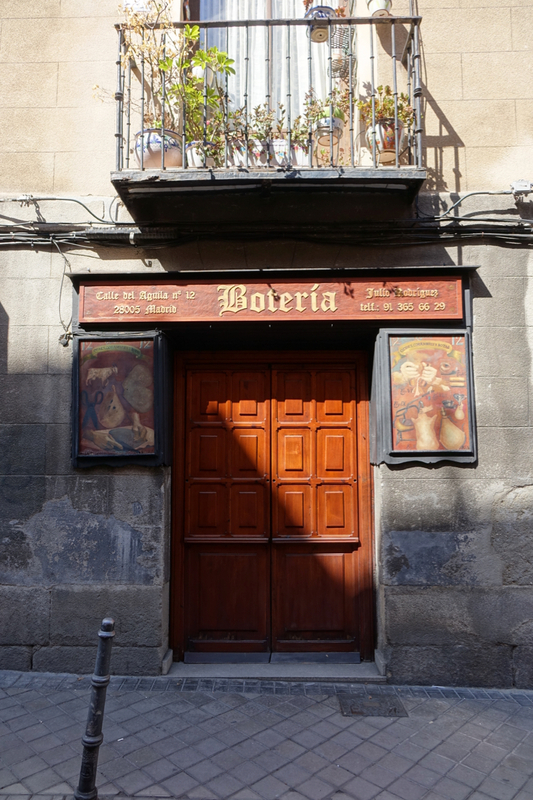 The botería I was standing outside is one of the last traditional makers left in Madrid. I was sad to have missed it, but the guy’s got to get a day off right?! 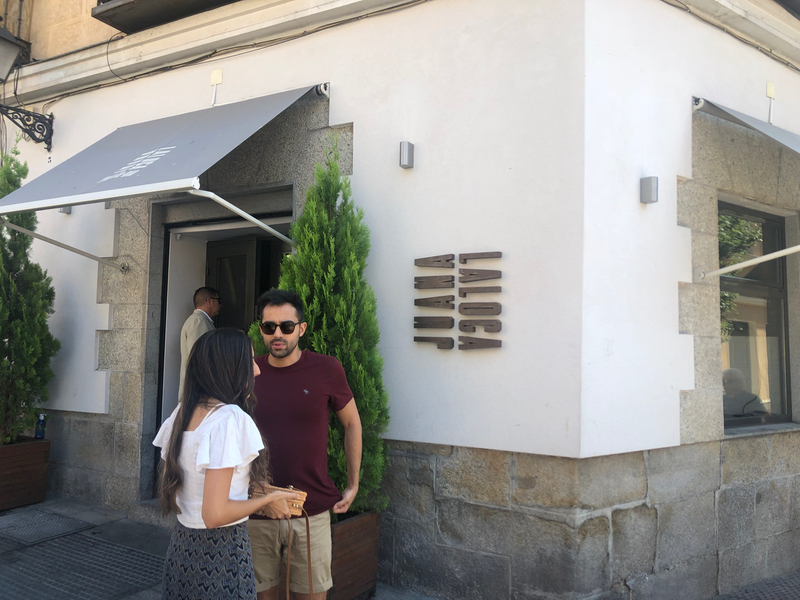 By now pangs of hunger were gathering in my stomach, so I decided to head back to the restaurant I’d spotted earlier, called Pintxos Juana la loca. There was a slightly intimidating guy manning the door, but as I approached, he opened it for me with a bit of a smile, and I stepped inside. Standing room only was an understatement. 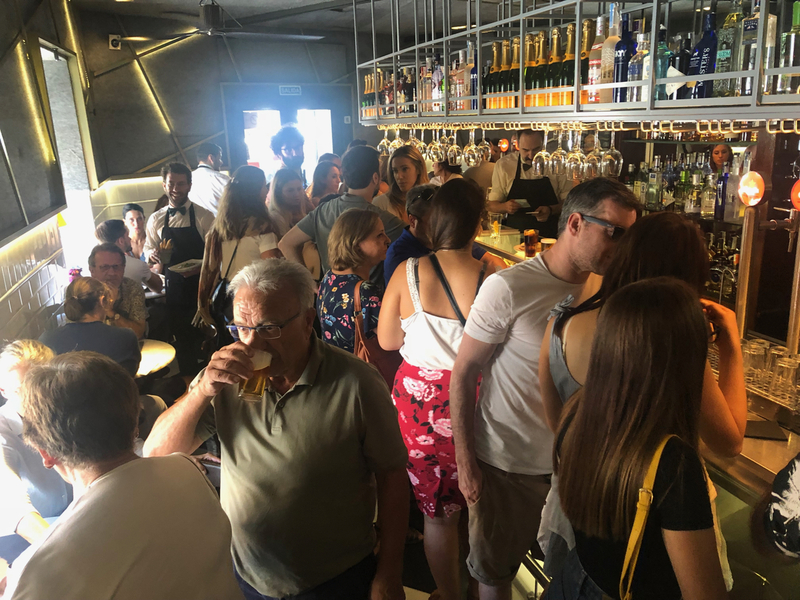 It was so busy I didn’t really know where to go – but eventually I made my way down to the end of the long bar. There, the man that looked like he was in charge (i.e. probably the Maître d’) smiled and said hello. I asked for a table, but I knew as I said it that wasn’t going to happen. He explained that it would be at least an hour before a table was available but he could get me seated at the bar before then. I was happy with that, and he went and got me a drink as I stood at the service end of the bar. There were three people standing at the corner of the bar beside me eating, with literally one square centimetre of space on the bar free in front of me. And there I stood for about twenty five minutes – standing staring in to space as there wasn’t even enough room to turn around or bend down and get something to read out my bag. The Maître d’ was great – checking in on me all the time and reminding me he was keeping an eye out for a free spot for me. Eventually he told me the three people beside me would soon be leaving, and sure enough they did. Probably forty minutes had passed since I’d come in – so I was looking forward to getting something to eat! I went for two pintxos. 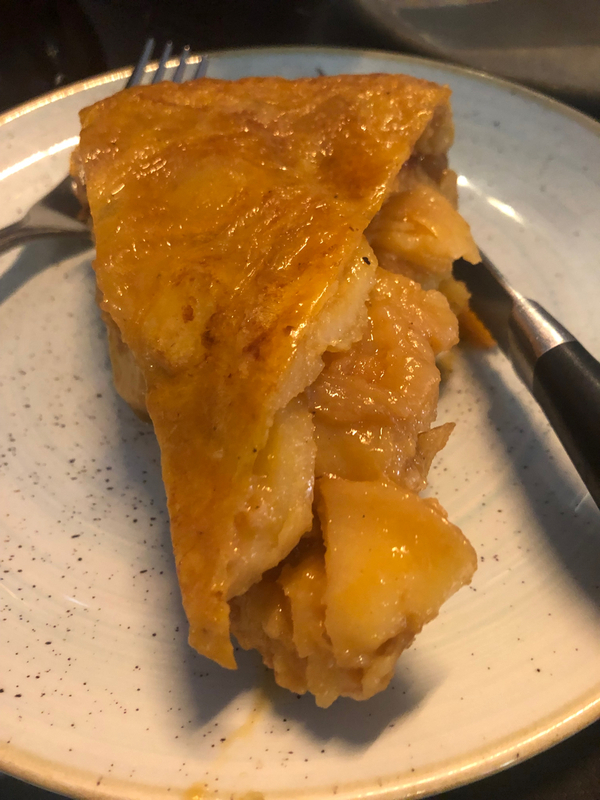 One was the restaurant’s “world famous juicy potato, eggs and confit onion spanish ‘tortilla’.” That arrived first. Would it be worth the wait? There are no words to describe how delicious it was. I literally savoured every single morsel. It was probably like a bazillion calories, but the whole thing just kind of melted in my mouth in an eggy, potatoey, onioney delicious mush. The only way I can think of to describe how good it is is that it would be worth walking at least three miles for. In the rain. Next – well I’m a sucker for the old sardines. 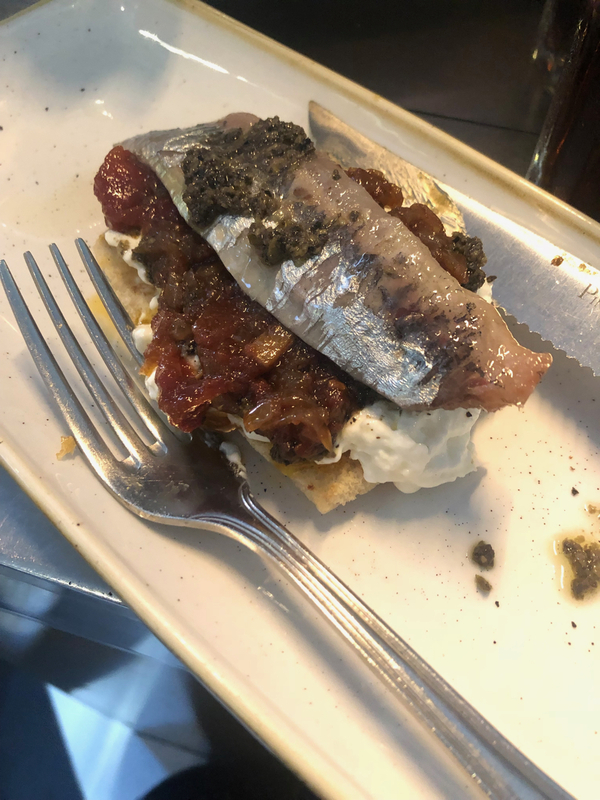 For my other dish, I ordered smoked sardine with italian burrito, tomato and cardamom chutney. The Maître d’ told me that’s what he usually has, and I could see why. After both dishes, I could totally understand why the place was packed. My two dishes – along with two diet cokes – came to €18,50. And it was worth every penny. 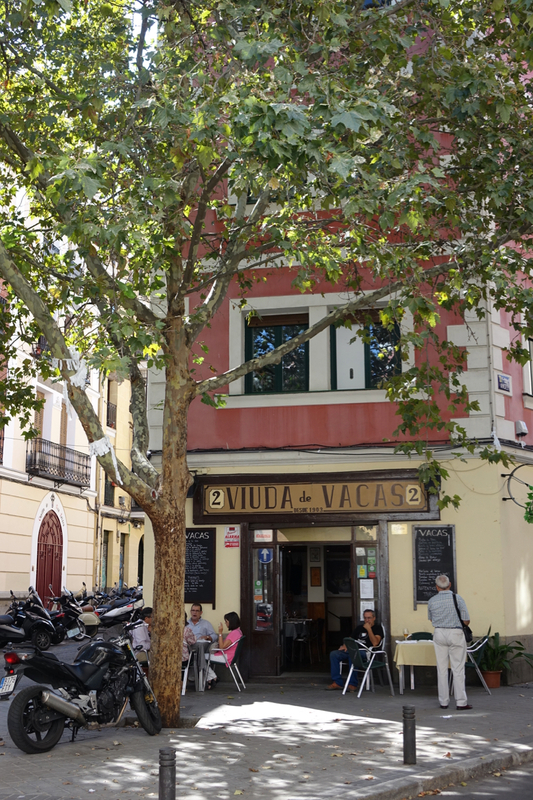 If you’re ever in Madrid, you need to check this place out. 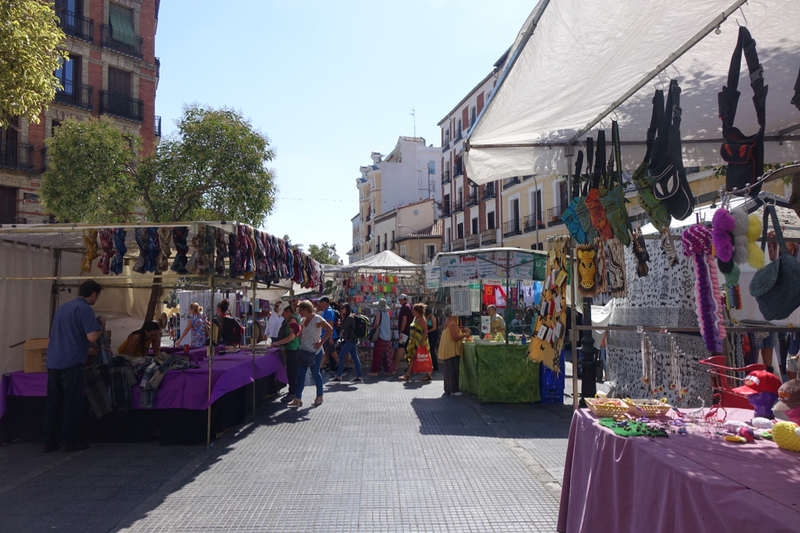 With the bill settled, I headed back out into the hot Spanish sun, and went off to explore the flea market. By now, it was just after 3pm, and I knew if the market was still going, it would be winding down, but I thought I’d have a stroll through it anyway. As I’d expected, stall owners were packing up their wares, and the crowds had nearly gone. I had a wander about, but there was nothing really that exciting to see. I decided to head back into the centre of town and have a quick look at the shops as I had a bit of time to kill before my next activity. 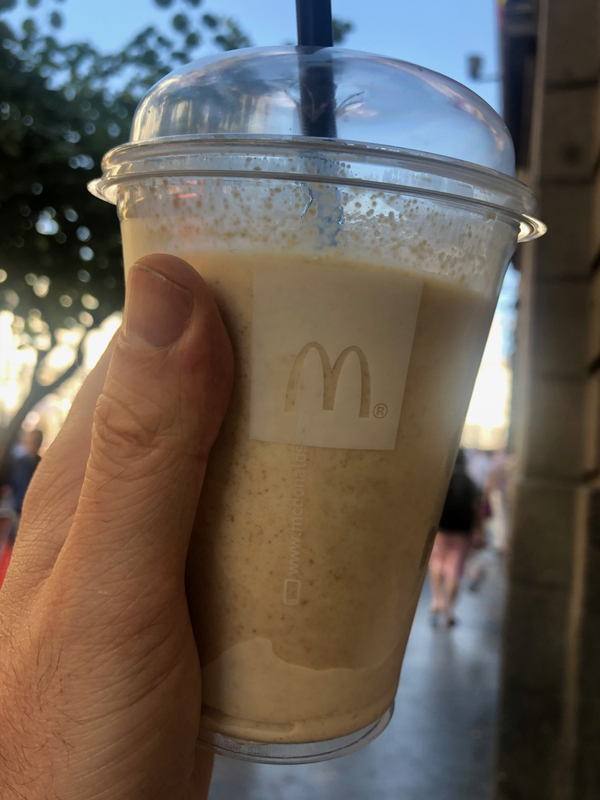 Via the square that I constantly seemed to come across at random – where I’d visited the hammam baths earlier on my trip – I arrived back at Puerta Del Sol and nipped into McDonald’s to pick up a Lotus Biscoff shake I’d seen advertised earlier. Delicious! If you haven’t tried Biscoff spread by the way, you are seriously missing out. 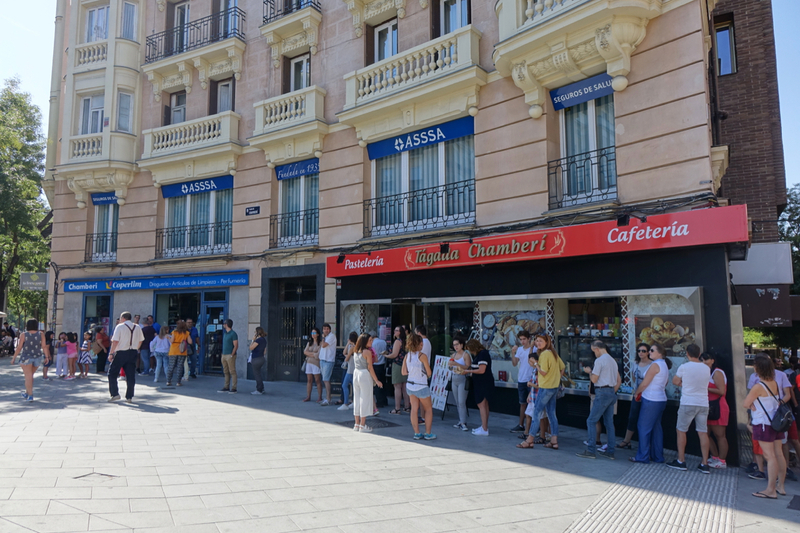 …I started walking towards the one big attraction in Madrid I’d so far failed to visit – the Museo National del Prado – or the Prado Museum. 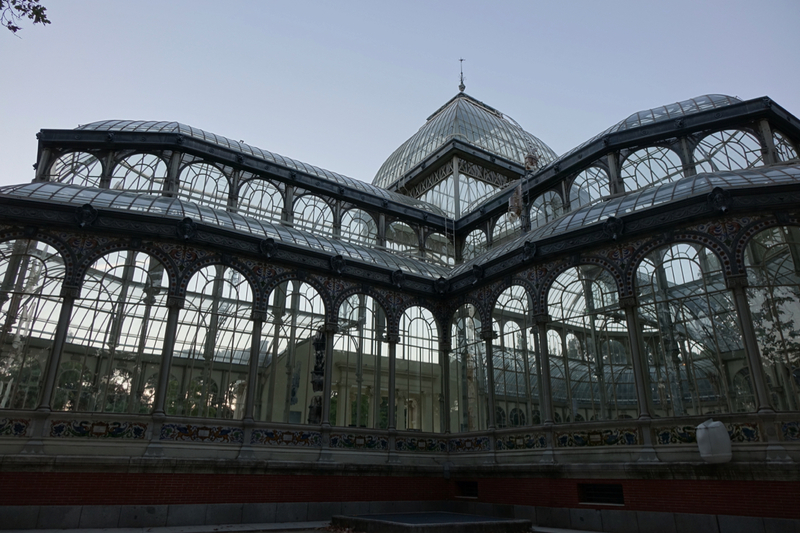 It’s Spain’s main national art museum, and is widely considered to have one of the best collections of modern European art. 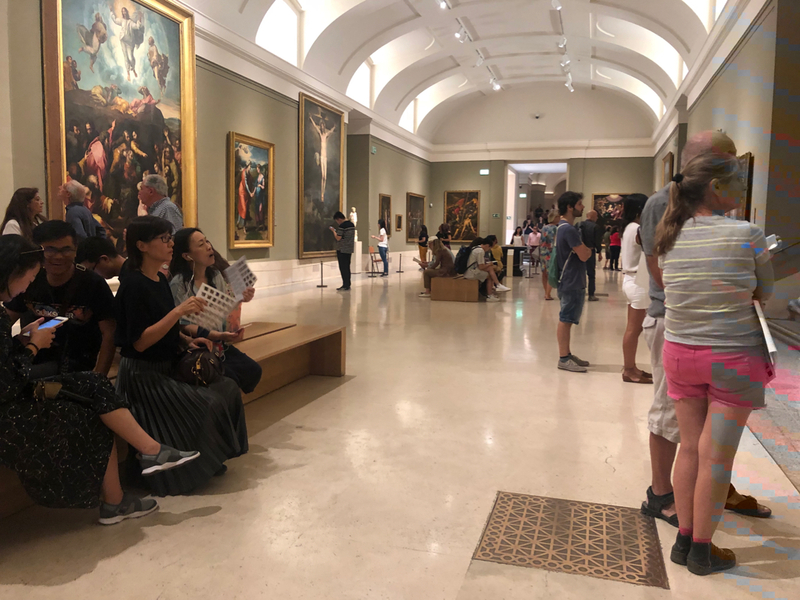 I’d left it late in the day to visit, because if you wait until 5pm on a Sunday you can gaze at Goya’s works for free – avoiding the normal €15 entrance fee. I was just two minutes’ walk away by about twenty to five, so thought as I wandered down the street in the sun that I’d timed it absolutely right. 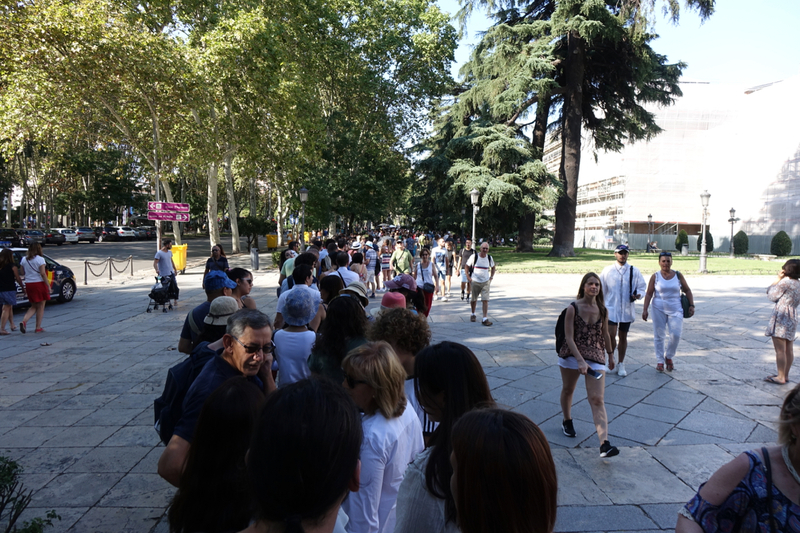 What I’d failed to consider however, was that I might not be the only one wanting to visit the Prado for free. An enormous queue snaked its way right down the length of one side of the building. Round little paths, and continued on. I swear it took me about ten minutes just to walk to the end of it. I did at this point consider just leaving, but I thought I’d see how quickly it moved. Not very quickly was the answer. However, I did see two interesting things while I was in line. 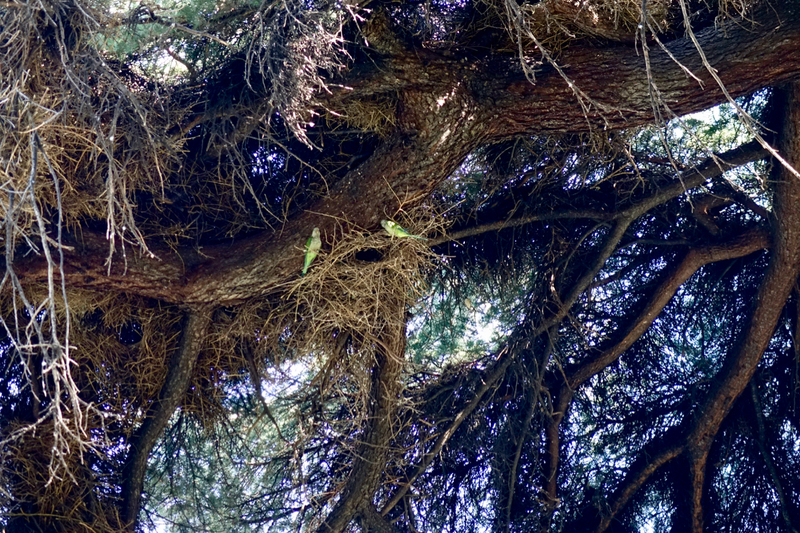 Firstly, birds actually going in and out of a nest and feeding chicks. I had never seen that before irl! 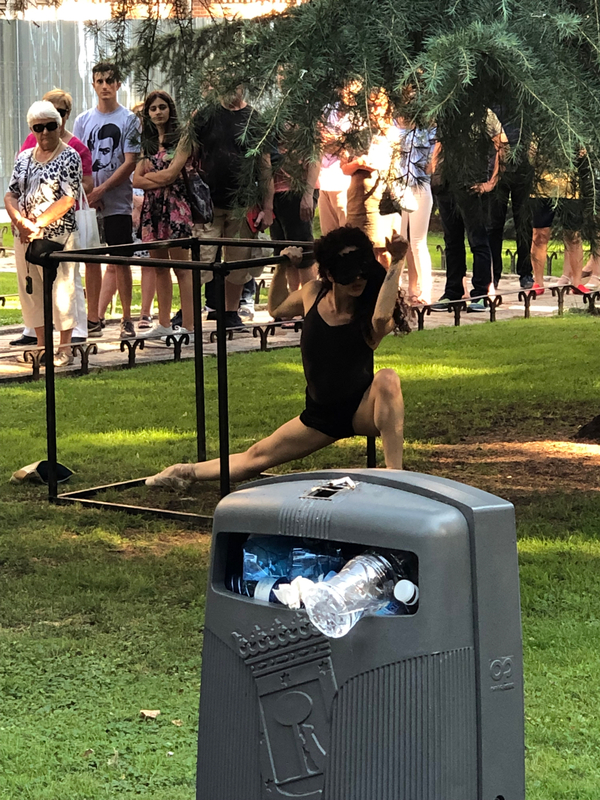 Secondly, a woman who every now and then would get up from a seat, wander over to some metal square structure, and stretch around it. Wearing an eye mask. Then she’d go around seeking donations for her work. Yeah right love! She got nothing from me! After waiting for 45 minutes I eventually got to the front of the queue, got my free ticket and practically sprinted towards the entrance. I had an hour and fifteen minutes to get around one of the world’s best collections of modern European art. I was dying to get rid of my heavy bag, so made a move towards the cloakroom only to be blocked by an aggressive looking security lady who practically shoved me towards a metal detector. Undeterred I waited until her back was turned and managed to check my bag in. Take that security lady! Having severely under-estimated the number of people that were interested in gaining free entry to the museum, I really hadn’t left myself enough time to appreciate everything there was to see. With hindsight, I should have just paid the fifteen euros earlier in the week and taken a leisurely look around. But it was too late now. I saw signs advertising a one hour recommended route with audio guide – which would show me the highlights of the museum. So I paid a couple of euros for that, grabbed the map, stuck my headphones on and walked into the first gallery. Immediately I was amazed. 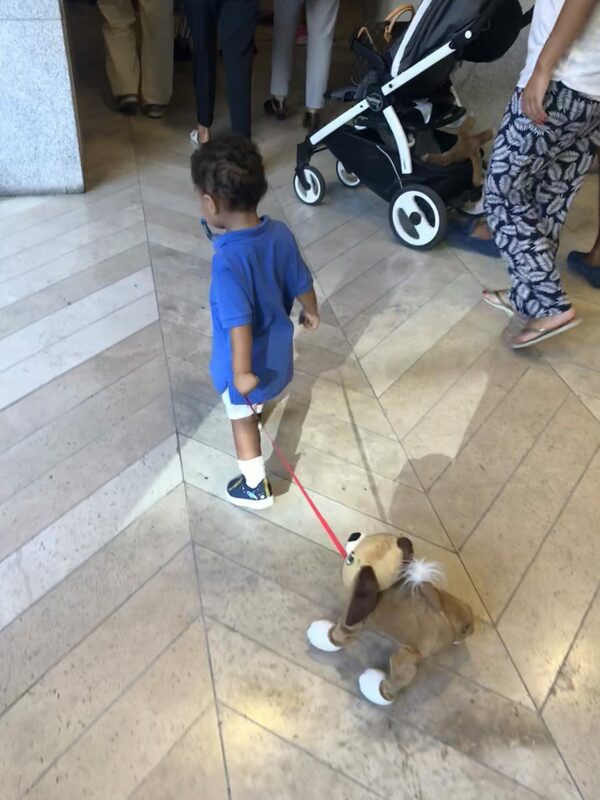 Not by works of art, but by this boy’s toy dog on a lead whose LEGS MOVED WHEN HE PULLED IT. It was like having a real dog! After removing my jaw from the floor, I started listening to the audio guide which directed me towards a horrifically grim triptych with fish eating men, people choking nuns and all other kinds of not very pleasant behaviour. I got one photo…. And then was told by a security guard that photos weren’t allowed. 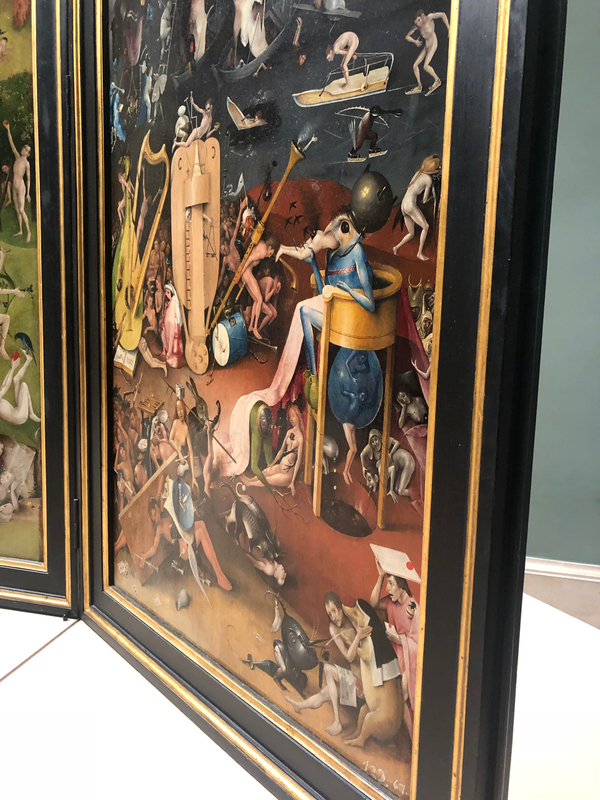 I zipped around the galleries, stopping to look at pictures which grabbed my attention, and listening to the audio guide. I did manage to sneak one more picture inside…. Before I knew it, it was ten to seven. With the museum closing at seven, I made my way back to the cloakroom, after handing in my audio guide. 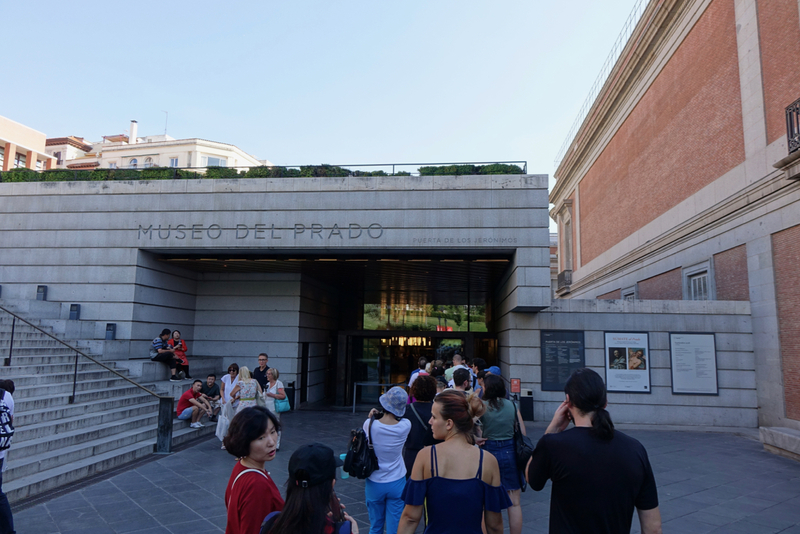 Take it from me – an hour and fifteen minutes just isn’t long enough to visit the Prado Museum. I didn’t even make it around the one hour ‘highlights’ tour. 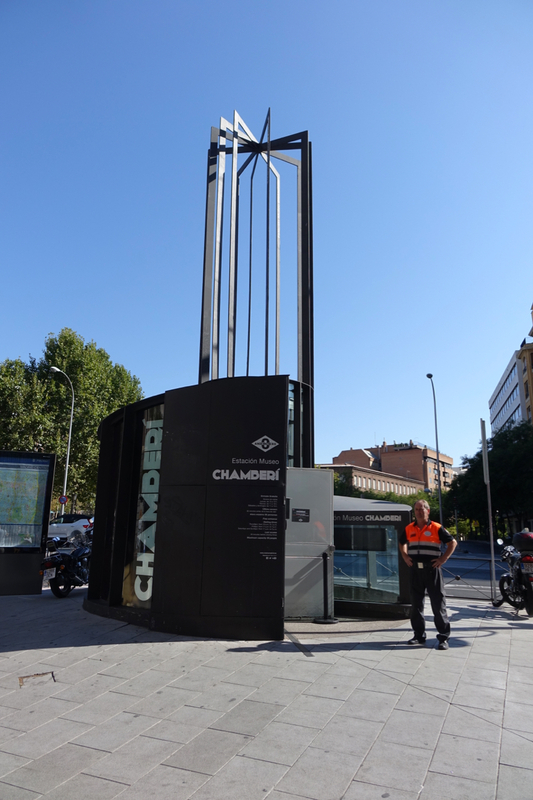 My one regret about my trip to Madrid is that I hadn’t visited the museum earlier in the week. That’s the downside of taking advantage of the Sunday free ticket offer. Even if you were in the door at five pm sharp, I think you’d struggle to see everything you wanted. I jumped back on the metro. As it was my last night in Madrid, I wanted to catch a sight which I’d heard about numerous times – at a venue I’d visited on my very first morning in the city. Getting off at the same stop where I’d alighted to start my bike tour, I made my way to the Parque de la Montaña. 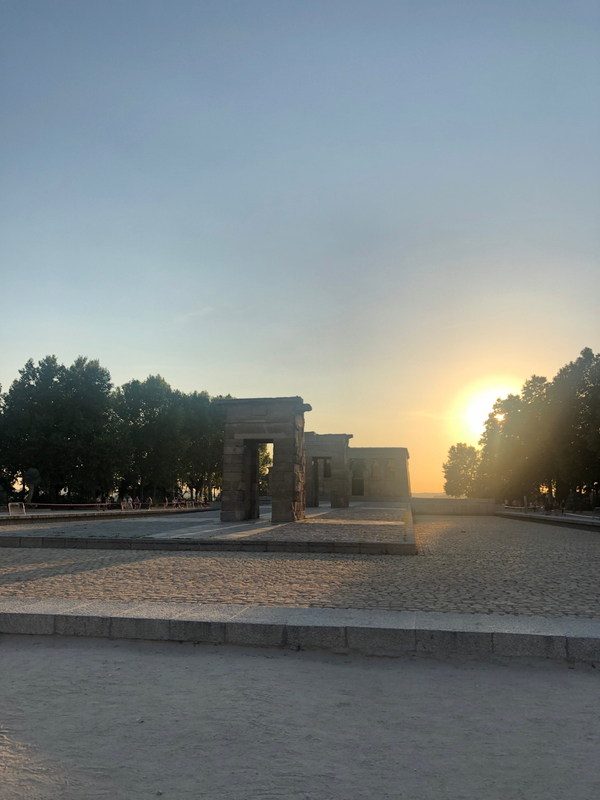 As I passed the Temple of Debod, the sun was beginning to lower in the sky, meaning that this time, I’d timed my trip perfectly. 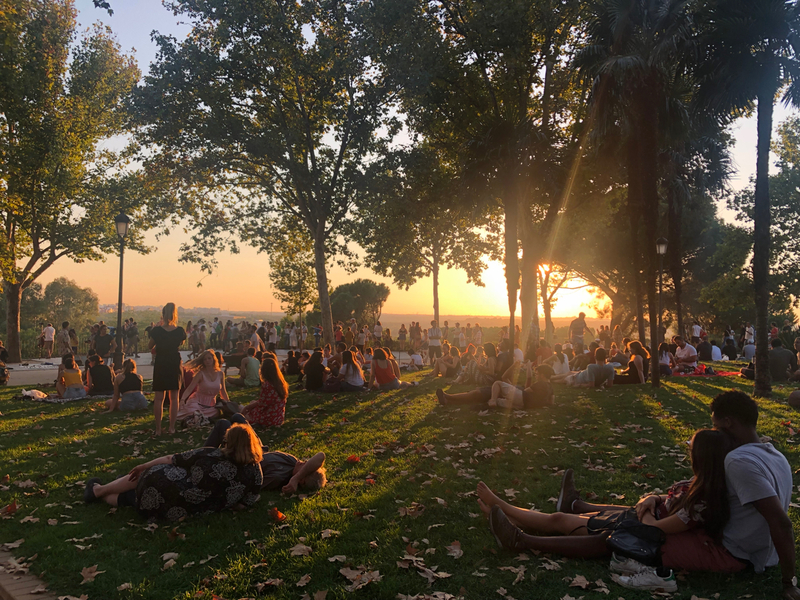 I’d been told numerous times that Madrid’s citizens often gather in the park to watch the sun go down – and I thought catching the sunset here would be the perfect way to end the last full day of my trip. 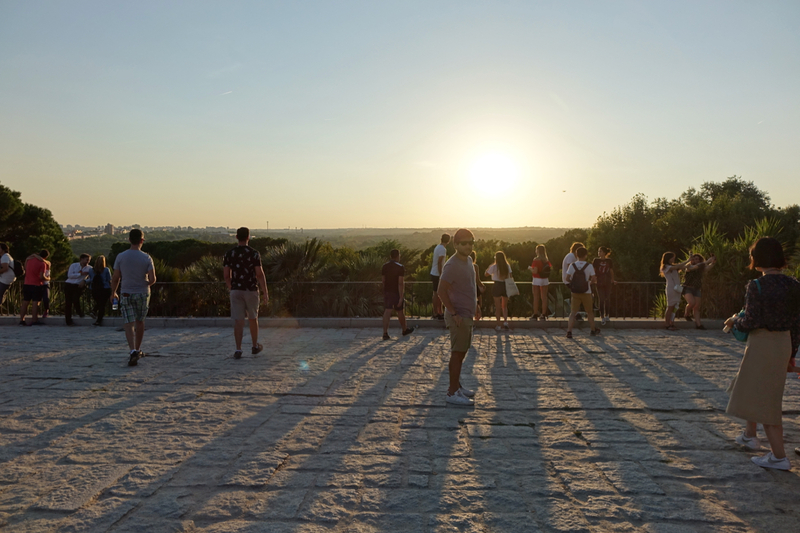 Already crowds had gathered at the edge of the park giving a view over the city. There were selfie sticks being used everywhere you looked – and people wandering around selling them too. Couples hugged, friends posed and some serious photographers were poised too. After a while, people had gathered on blankets in the grass as buskers’ music filled the air. The sky turned a hazy blue, then orange as the sun sank deeper. Buildings gained a pink glow. It was quite the sight. And what was nice was that the crowd that had gathered ranged from the very young to the very old. 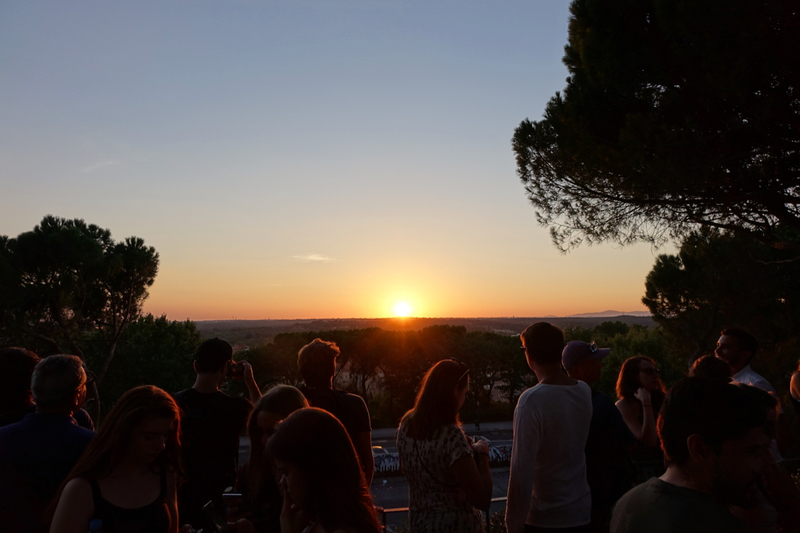 There were no signs of trouble – just everyone enjoying the atmosphere. Rather reluctantly, I turned my back on the sunset, and headed back into town. 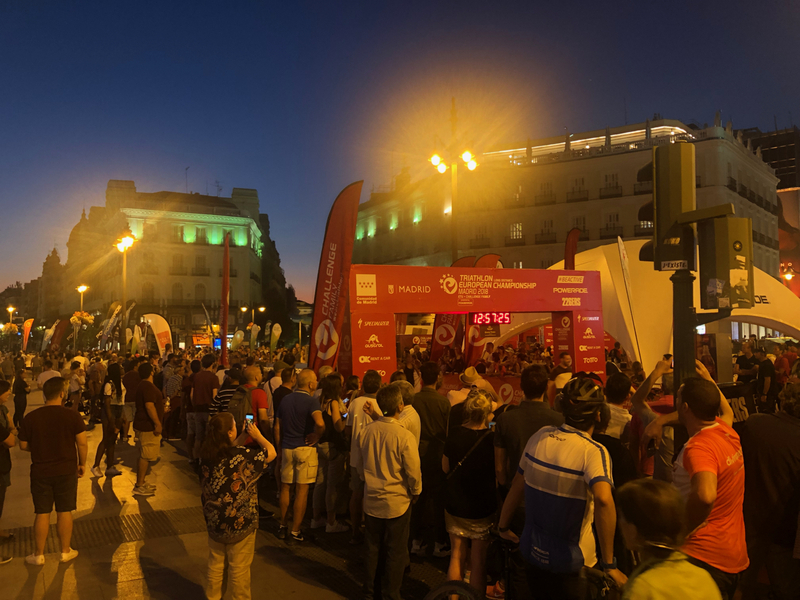 As I reached the Puerta de la Sol for the last time, the square was filled with spectators watching tired triathlon competitors stagger over the finish line. 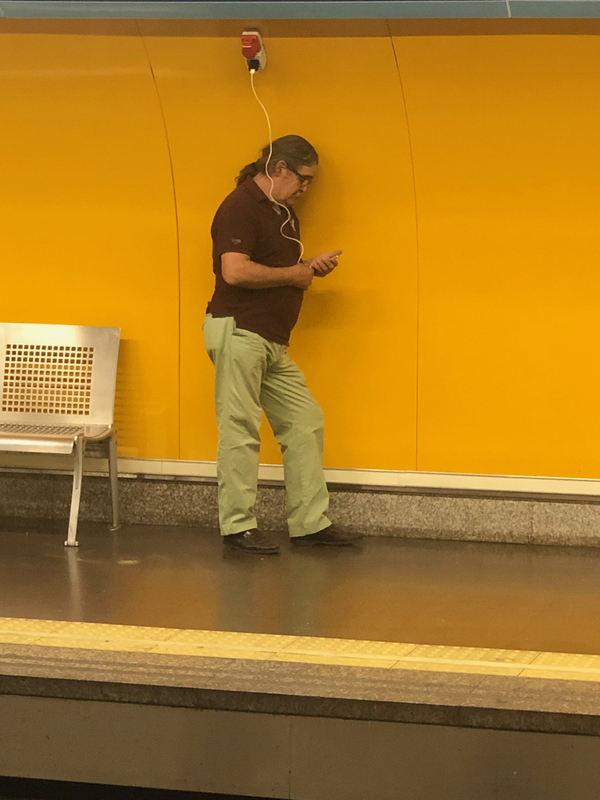 I got back on the metro back to the hotel, en route admiring this man’s ingenuity in charging his ‘phone. After polishing off dinner, I set my alarm clock for an early start, and turned in for the night. My flight home wasn’t until just after lunchtime the next day, and I had one place I wanted to revisit before I left Madrid. I managed to get up just after my alarm went off the next morning. 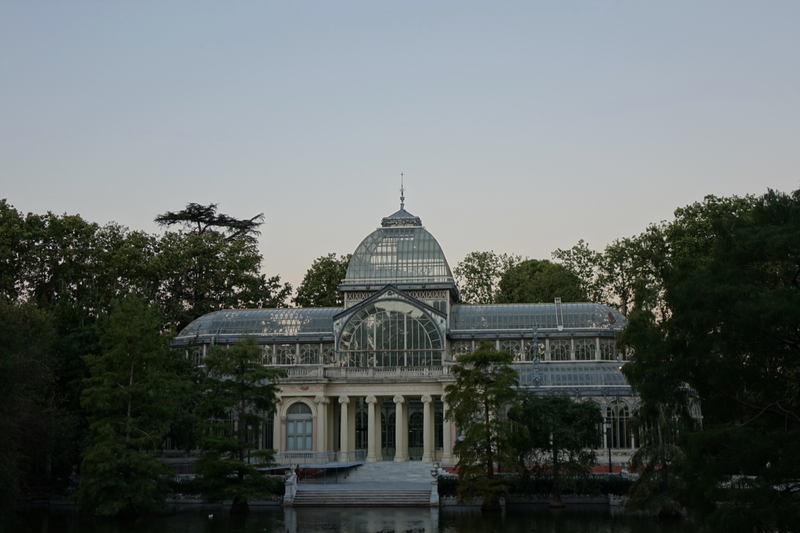 I was keen to have a proper look at Buen Retiro Park – and its crystal palace. I also had to find a post office and get my postcards posted before heading to the airport (there wasn’t a post office in the terminal I was leaving from). And I wanted one last breakfast in the hotel! …realised I was far too early. It was 7.15am – and still completely pitch black. There was no point in heading to the park if I couldn’t see the palace! I decided to head back to my room and finish packing, and half an hour later, the sky was beginning to lighten, so at a quick pace I started walking to the park. Entering through the nearest gate, I worked out that I had no idea where the crystal palace was. Trusty Google Maps told me it was a fifteen minute walk, and time was not on my side. So spotting a scooter, I decided to rent it and scoot to the palace. Very quickly I learned that trying to ride a scooter on a gravel path is NOT a good idea. My eyeballs were jiggling to such an extent I felt they were going to fall out my head. My bones were rattled – it felt – beyond repair. Luckily I soon came across a smooth tarmac path, and turned on to it swiftly, following signs for the palace. Finally, I was there. I paused my scooter hire, and headed towards the building, eager to step inside. Except I couldn’t. I’d naively assumed the palace was open all hours, but it’s not. In fact it wasn’t going to open for another two hours. Through the locked doors, I watched a cleaner slowly pushing a mop around the floor. I’ll probably never know what the palace looks like from inside! I consoled myself with wandering around the exterior of the building, taking photos as I went, and then jumped back on the scooter – this time sticking to proper paths and roads. On my way out of the park, I stumbled across what is widely acknowledged to be the only public monument to the Devil. The statue on top of the Fountain of the Fallen Angel depicts Lucifer at the moment he was cast out of heaven. Slightly sinister stuff! After getting back to the hotel, I went in search of a post office. 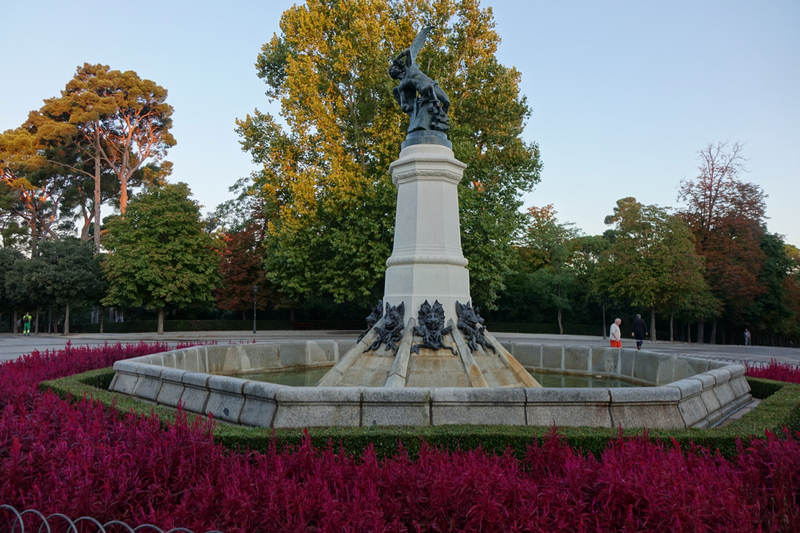 I’d checked when I was in the park, and in the hotel, and the nearest post office was a good 20 minute walk away from either – time I didn’t have. Reception had told me tobacconists would sell stamps – I just needed to find one. Thinking the station was the obvious place, I walked its length in vain. In the end, I walked out the other side of the station, and spotted one down a small street. Inside was practically bare, and I had my doubts when the woman came through from the back to serve me. Sure enough though, she not only had stamps, but ones for international use as well! Dropping my postcards in a post box en route, I made my way back to the hotel, and went for breakfast. 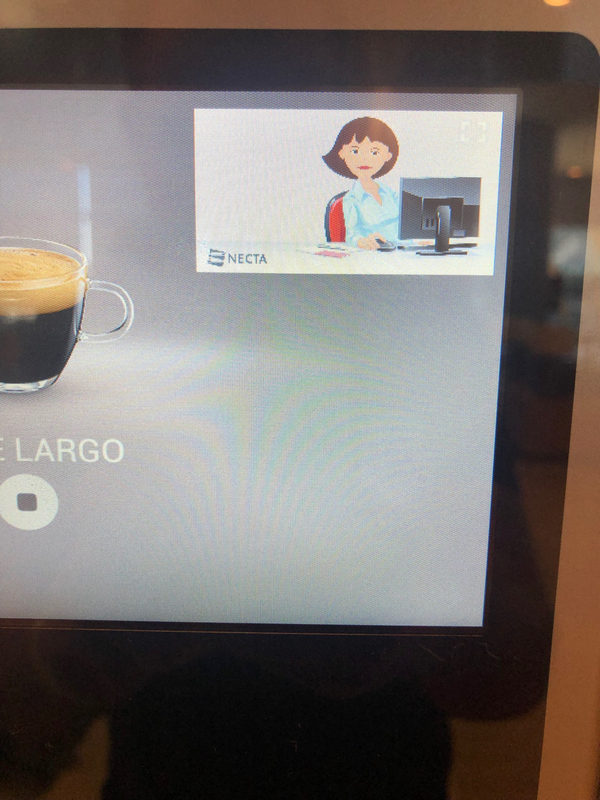 I was determined to get a table on the balcony so quickly grabbed a coffee from the machine and left it on a table while I went to get some food. As I made my way back to the table, two women arrived at it, with one of them laying a glass of orange juice down on the table. Sensing me arrive, they turned around and gave me a look that could seriously do damage if not kill. They began to talk loudly at me in some language I couldn’t understand. I pointed at my coffee cup and glared at them explaining (in English) I had been there first, but their voices just got louder and louder. I was raging inside, but decided to just walk away. I looked around for another table outside, and after walking around for a couple of minutes, eventually saw someone get up and leave. I grabbed their table – which was actually better than my stolen one as it overlooked the street. Which calmed me down a bit. After grabbing my bags, having one last look around my room to make sure I’d left nothing behind, I settled my bill, and checked out. Heading into the train station, I went up to a machine to get a ticket for the airport train, but the machine wasn’t working. So I went to another one – and that wouldn’t take cards. Then another which yet again wasn’t working, much, it appeared, to someone’s confusion. 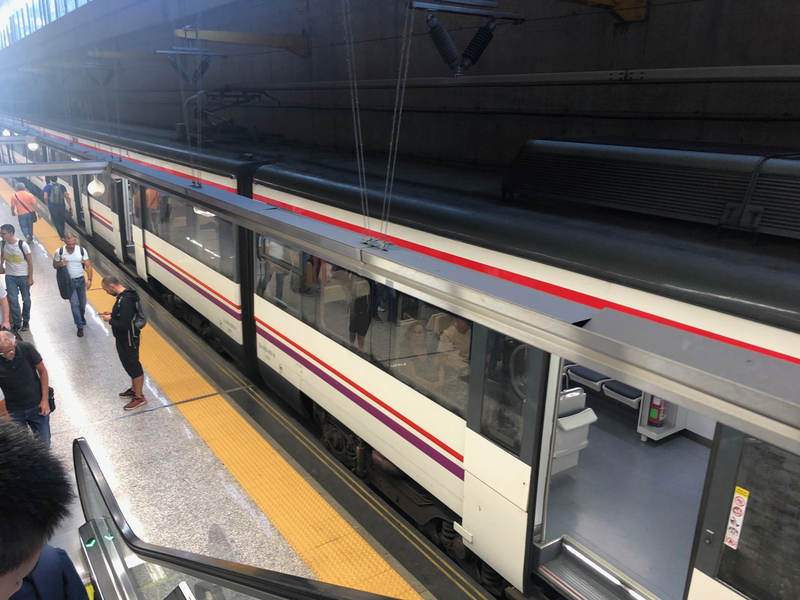 Eventually, after about ten minutes or moving from machine to machine, I got my ticket, navigated to the right platform, and jumped on the train to the airport. Once there, check in was very easy and pain free. 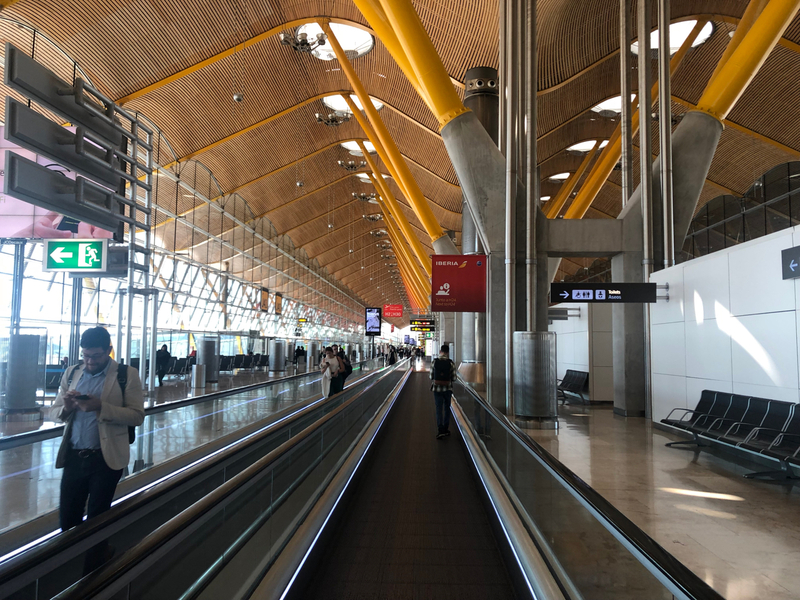 Unfortunately – as I’d been looking forward to visiting the Iberia lounge in their home city – I was told the lounge in my terminal was closed for refurbishment. I stuck my head in a tiny temporary lounge, but it was before security and didn’t look great, so I didn’t bother staying. The attendant there said that if I made my way to the lounge being refurbished, someone outside it would give me a voucher to spend at selected food outlets in the airport. After clearing security in literally ten seconds, I made my way to the closed lounge, picked up my voucher, and decided to resist McDonald’s and pick up a sandwich from Eat instead. I chose a wrap, a bottle of diet coke, and a packet of crisps, and thought I’d save them for the plane. I handed over my voucher at the till only for the lady to start shaking her head and saying “no, no, no, no, no”. I just looked at her inquisitively as she pointed at my diet coke and said “no, you can only have water”. Then at my crisps as she said “no crisps”. Then at my wrap as she said “cheese or egg sandwich only”. I could feel the rage building inside me. The voucher clearly said “soft drink or water or beer and sandwich or baguette or salad”. I looked at her and said “So I can’t have any of this at all”, to which she smiled and defiantly replied “no!”. Well she got her way, as I just dumped everything back in the cabinets and left. Luckily I was able to access the non-airline lounge in the terminal, so decided to head there and catch up on writing my blog. 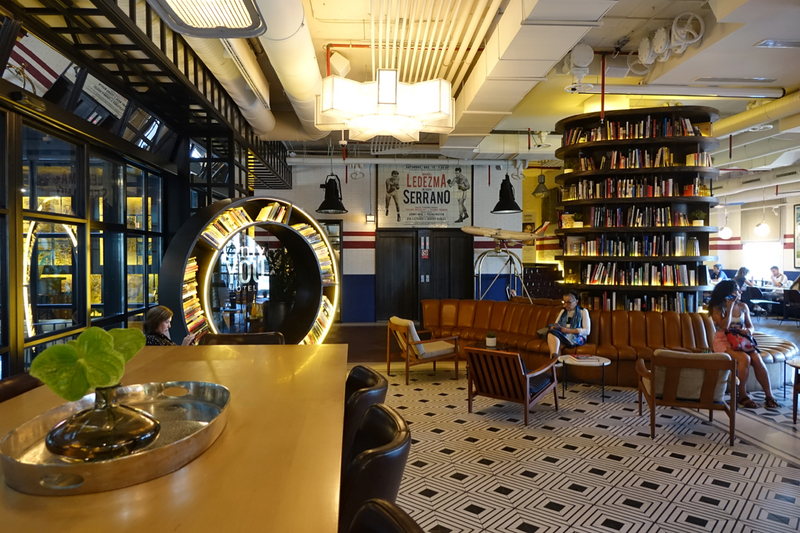 It was nicely decorated and quiet – mostly occupied by business people working away. 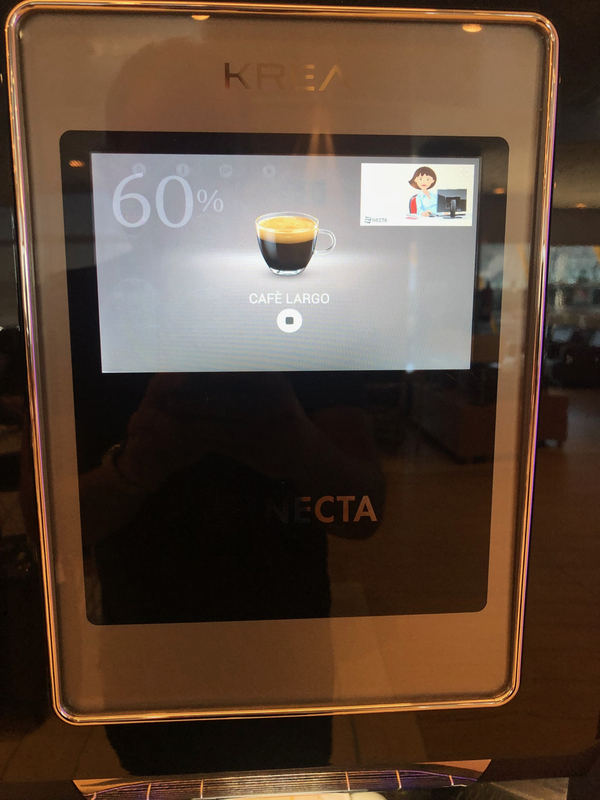 I grabbed a coffee from what is possibly the fanciest coffee machine I have ever seen… look at that display! Before long, it was time to make my way to the gate for my flight back to London before my connecting flight home. Once again, the plane was absolutely rammed, and as a result I wouldn’t describe it as the most pleasant experience. But, we arrived safely which is the main thing! 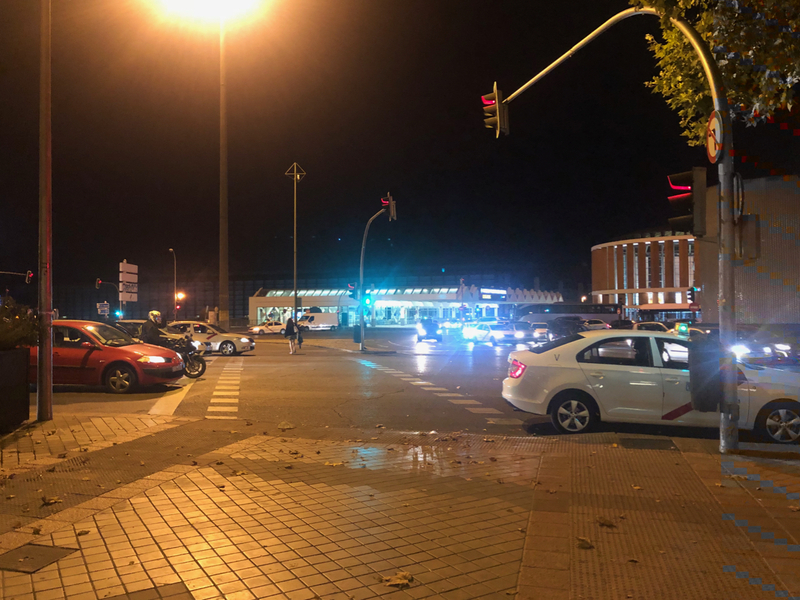 I’d had a great time in Madrid – though I’d felt a bit disorganised, and frustrated I didn’t really see a lot of what the city had to offer, I’d had a good time, and seen a very different side to Spain that I’d seen in Barcelona. And the weather – for the end of September – had been fantastic. My next trip would be someplace much colder!